Juventus just came up short in Serie A for the second year in a row. Unlike in 2000, it did not have matters in its own hands prior to the final game of the season, and even though Juventus fended off Atalanta 2–1 at home, Roma beat Parma 3–1, which meant the title landed with a Roman club for the second year running. 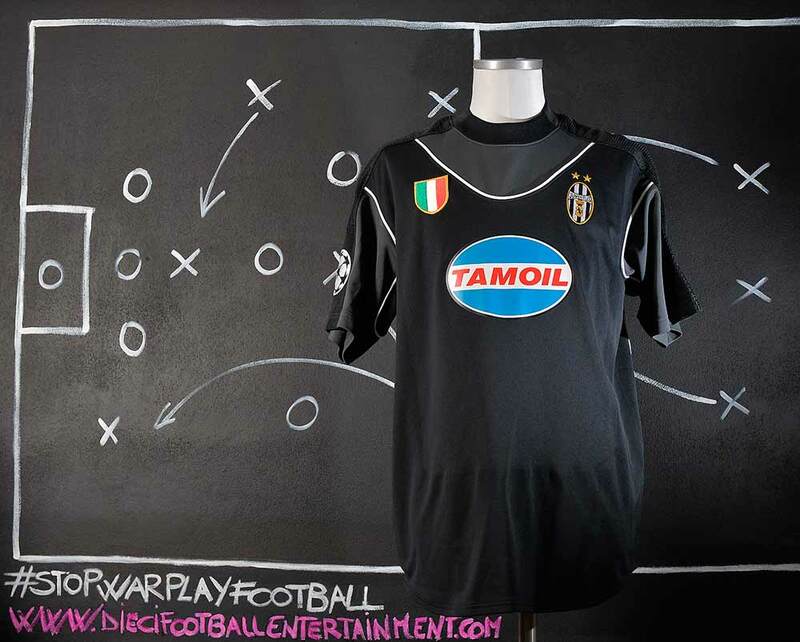 The determining moment of the title race had been a showdown between Juventus and Roma at the Stadio delle Alpi with six games to go, and the Bianconeri closing down on the Romans who had suffered a recent dip in their form. In front of their crowd, Juventus began the brightest. Two goals in quick succession by Alessandro Del Piero and Zinedine Zidane gave them a lead they held on to until the 79th minute, when Edwin van der Sar took center stage. The Dutch goalkeeper fumbled a long-range effort from Roma’s Japanese midfielder Hidetoshi Nakata, enabling the latter to score a fortunate goal. In added time, Vincenzo Montella equalized for the Roman club, thus denying Juventus a vital victory.La Vecchia Signora did win all five of its remaining games after that, but in the meantime, Roma did enough to make sure they didn’t lose the top spot of the table, thus winning their first scudetto since 1983. The success was celebrated wildly in the streets of the Italian capital, and the fact that Roma had beaten bitter rivals Juventus to the title made the supporters even happier. 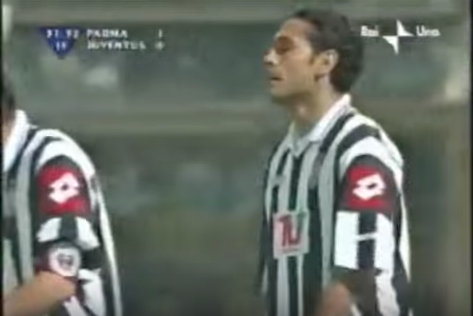 In the Champions League 2000/2001, Juventus was a major disappointment, getting knocked out in the first group stage of the tournament. The team was eliminated in the group stage of the Champions League, after Zidane was banned for head-butting Hamburger SV player Jochen Kientz.It was the first time in the club’s history that it had been knocked so early in the competition. This performance put Carlo Ancelotti’s position at the helm under even more threat. Ancelotti had already been associated in the previous season with the club’s worst run in any European competition since the 1987–88 season. As a man who had been associated with Juve’s rivals Milan, Roma and Parma for most of his footballing career, he had never been a popular choice with the fans, with frequent doubts being raised about his lack of concern for the club’s declining fortunes. 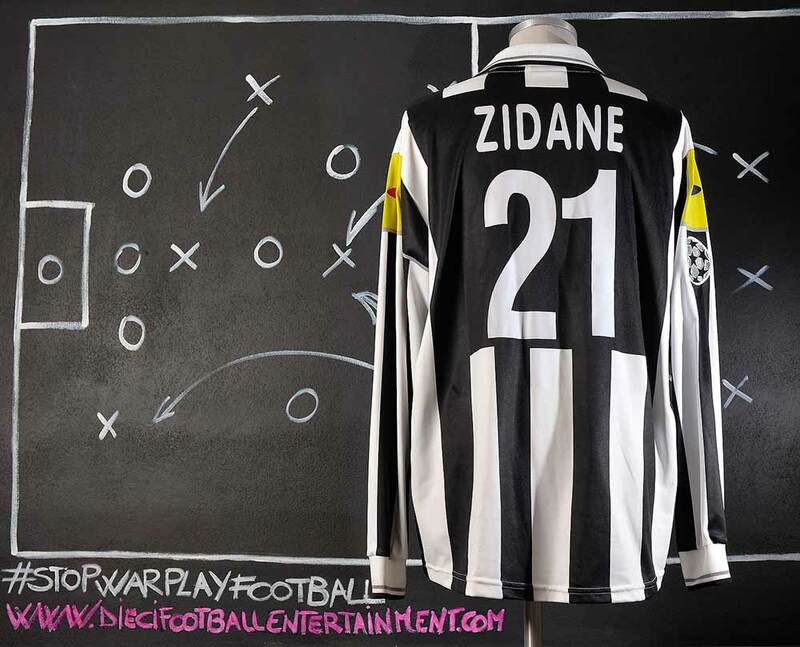 In this season Zinedine Zidane was named Serie A Foreign Footballer of the Year for the second time. After greatly impressing in his second spell with Salernitana, Iuliano caught the eye of several major scouts, most notably those of Serie A giants Juventus F.C.. 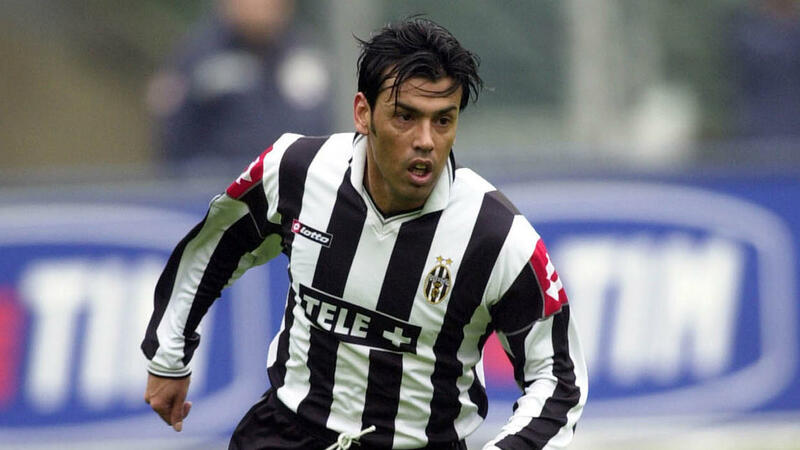 In July 1996, Iuliano transferred to the Torino based outfit, and was a big hit right from the start, as Juve continued their Serie A and European dominance. 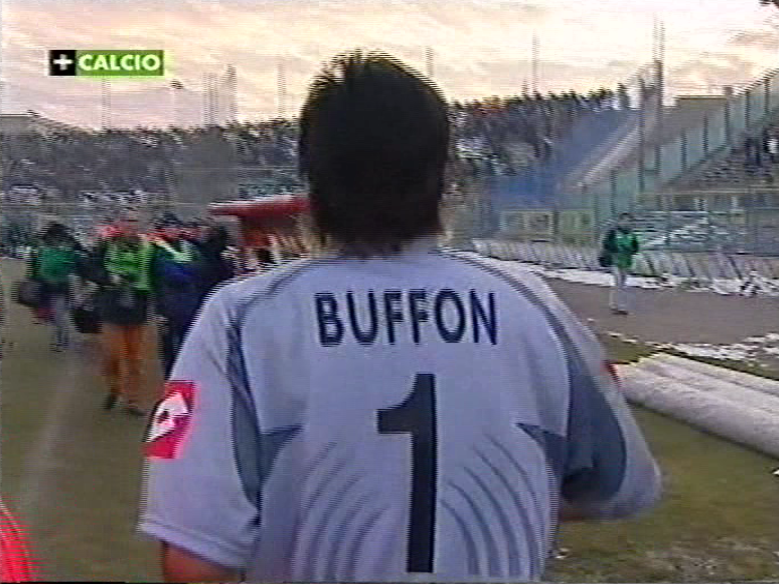 He made his Serie A début on 15 September 1996, 2–1 win over Cagliari Calcio. 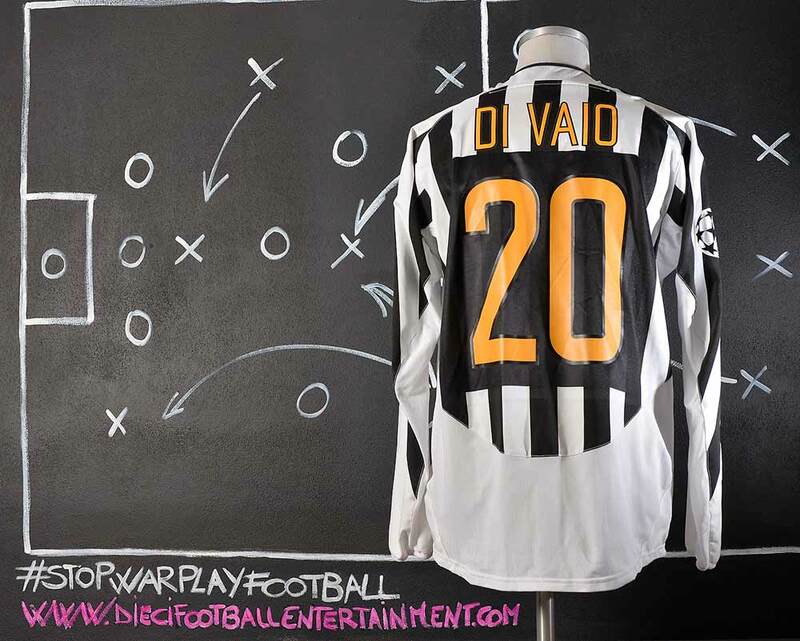 In his first season with Juventus he played in 21 league games scoring a single goal. Iuliano is also known for the episode involving Ronaldo where Inter claimed a penalty. Up to this day, newspapers cite this episode and in a recent interview to the newspaper “Il Tirreno” the referee, Piero Ceccarini, clarified, “From the images it is clear that Ronaldo runs into Iuliano, not vice versa: as a matter of fact, the Juventus player falls backwards, resulting from the impact of Ronaldo running into him. I was on the pitch, a few meters away. The intention of the defender was to stop the attacker’s progression, but the attacker moved the ball and the defender did not follow it. Iuliano was stationary at the moment of contact, there are no doubts about this. I told Pagliuca (Inter’s goalkeeper) that in basketball this would be an offensive foul. Perhaps I ought to have whistled a foul in favour of Juventus”. 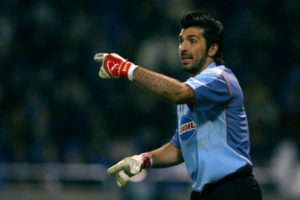 Iuliano would become an eventual starter for the club the following season, but was hampered by injuries in the 1999–2000 season, limiting him to just 20 appearances. Juventus had what was considered as the best defence in the world at this time, and teams strongly regretted ever going down a goal to the club, as they knew how hard it would be to score one back for themselves. 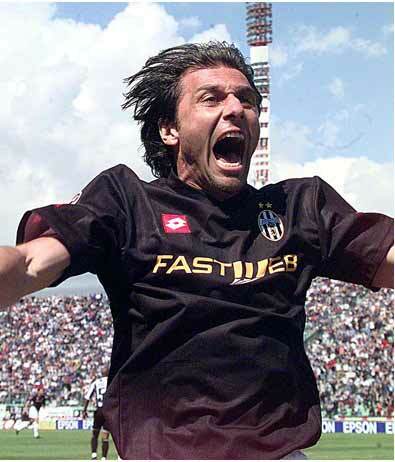 Iuliano formed impressive defensive partnerships with the likes of Ciro Ferrara, Moreno Torricelli, Paolo Montero, Gianluca Pessotto, Lilian Thuram, Alessandro Birindelli, Igor Tudor, Gianluca Zambrotta, Nicola Legrottaglie, and Fabio Cannavaro during his 10-year tenure with the club. 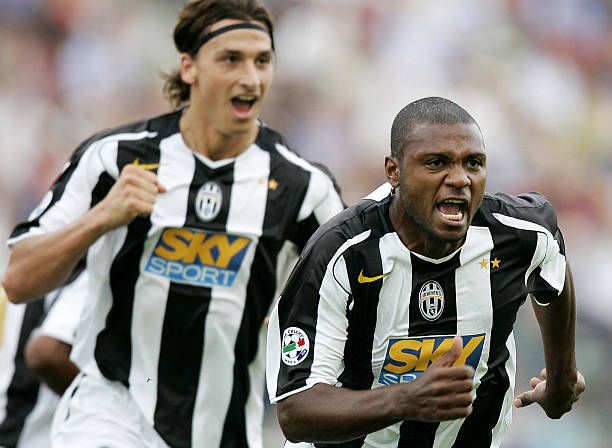 After the 2004–2005 Serie A triumph, veteran teammates Paolo Montero and Ciro Ferrara called it quits on their Juventus career (this title was later revoked following Juventus’s involvement in the 2006 Calciopoli scandal). The Uruguayan opted to return to his homeland, while Iuliano remained, but in January 2005, he left for La Liga side RCD Mallorca on free transfer after having not played regularly in the first portion season. 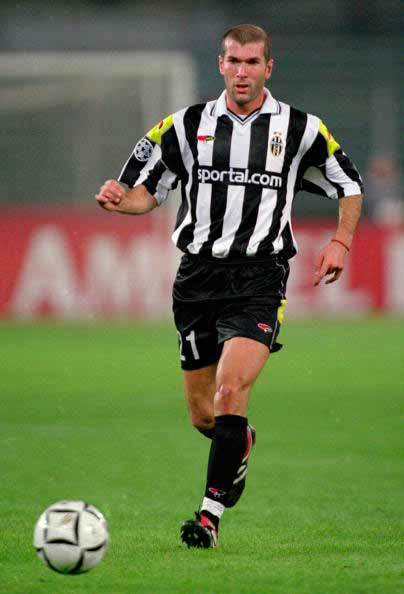 Iuliano made well over 200 total appearances for i bianconeri, scoring nearly 15 goals. 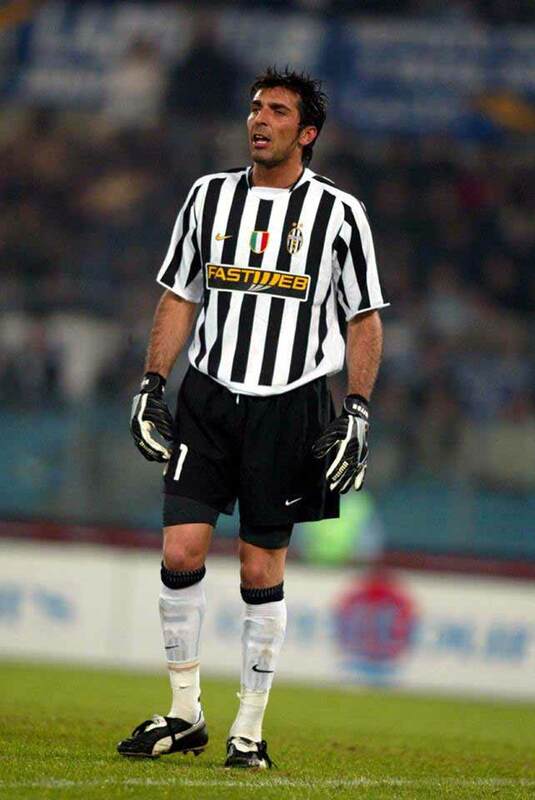 During his time at Juventus, Iuliano won 4 Serie A titles, an Intercontinental Cup, an UEFA Supercup and three Italian Supercups, also reaching three UEFA Champions League finals (in 1997, 1998, and 2003) and two Coppa Italia finals (in 2002 and 2004). This is the first time ever that official team supplier’s brand was not always visible on team’s shirt. In fact the official supplier of the season was Lotto. But Lotto’s brand and logos were only visible on friendly games shirts. During the Serie A games and Champions League the usual supplier’s logos on chest and on sleeves were not the Lotto’s ones but CiaoWeb logos. CiaoWeb was an Italian web company owned by Fiat and Ifil. 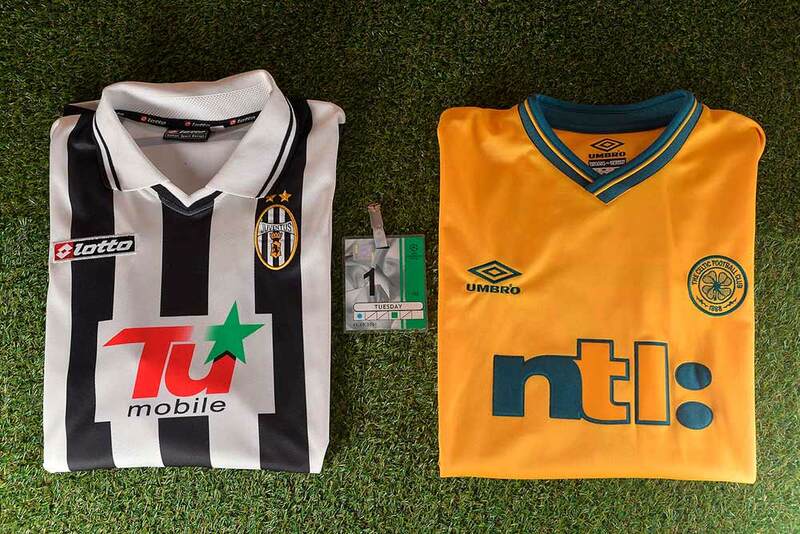 So basically the team’s shirts for Serie A and Champions League had a double regular sponsors on the shirt. O’Neill began his professional career at Nacional in the Uruguayan Primera División playing in the first team between 1992 and 1995. 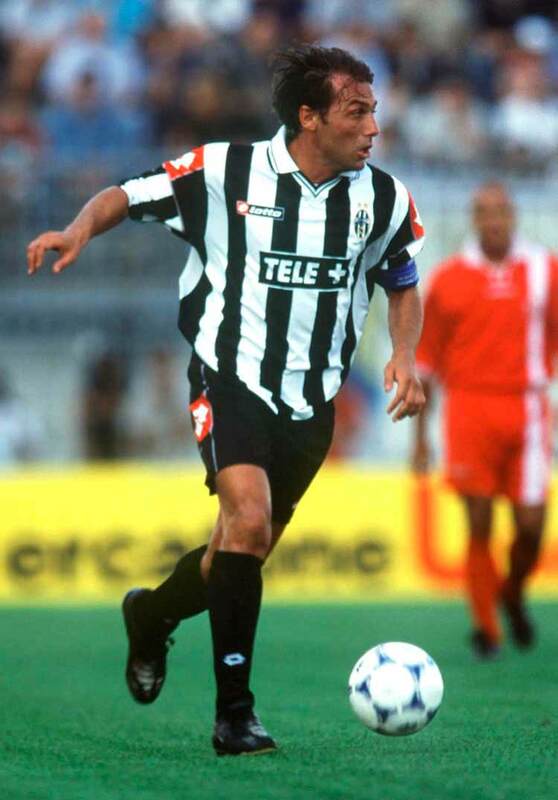 In 1996, he moved to Italy to play with Serie A club Cagliari. 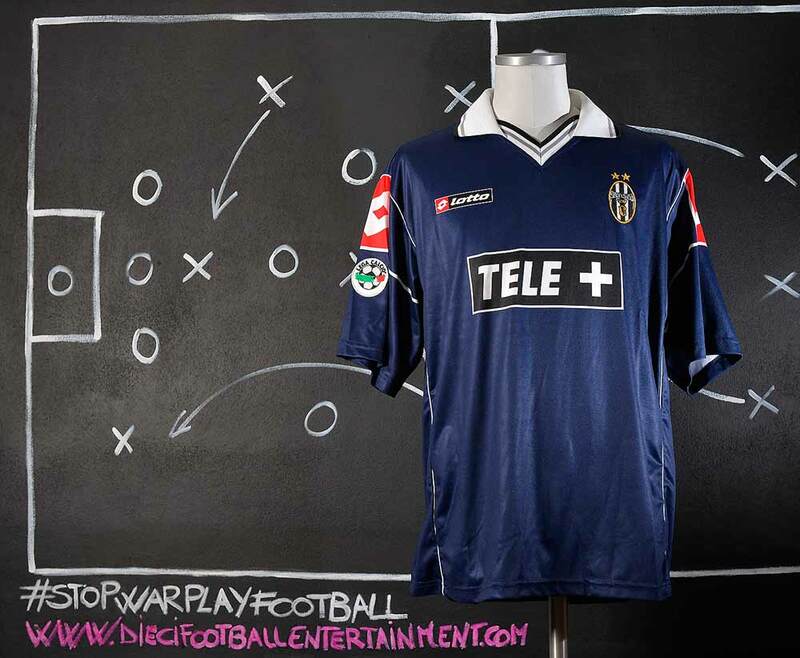 The club was relegated to Serie B in 1997, but promoted again in 1998. 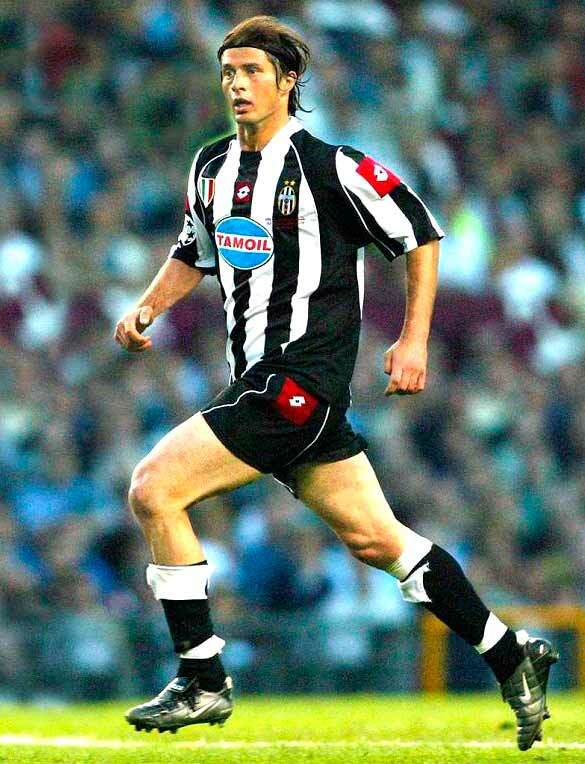 After Cagliari was relegated again in 2000, O’Neill was transferred to Juventus. 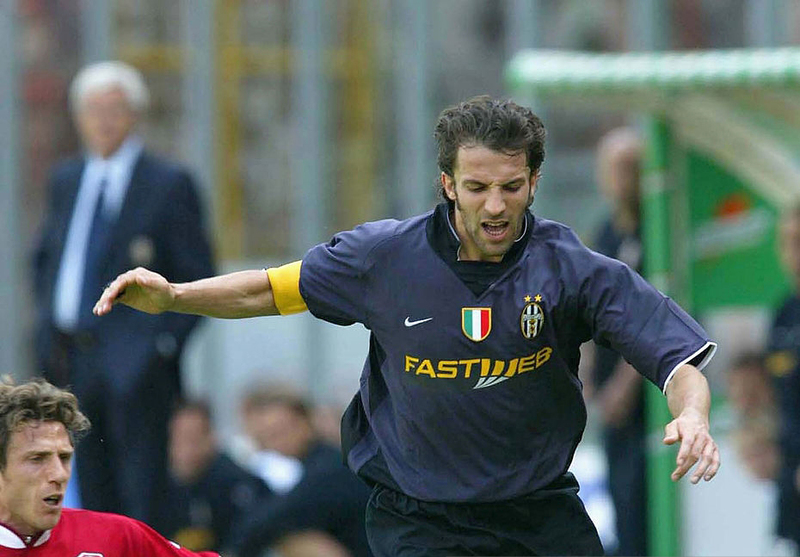 In January 2002 he moved to Perugia as part of a deal involving the transfer of Davide Baiocco to Juventus. He was released in the summer break and returned to Cagliari in Serie B. In 2012, O’Neill admitted to twice having fixed Serie A games in order to win bets. 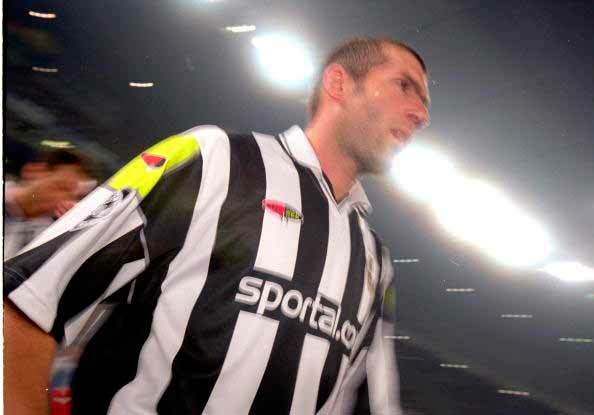 2000-2001 was also Zinedine Zidane’s last season with Juventus as he was sold for a world record fee to Real Madrid, but the Italian club compensated his loss with four new players during the summer, with Gianluigi Buffon and Lilian Thuram coming from Parma, and Pavel Nedvěd and Marcelo Salas came from Lazio. 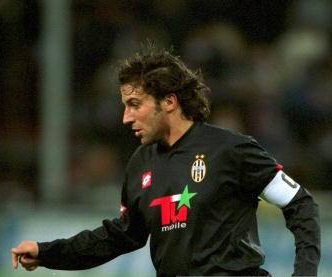 Juventus signed Fonseca in 1997, but he was once again played out of position on the left wing, as he had been at Cagliari and AS Roma. His goalscoring record in Serie A was very good considering he was not always a first choice player with Roma]] and Juventus. 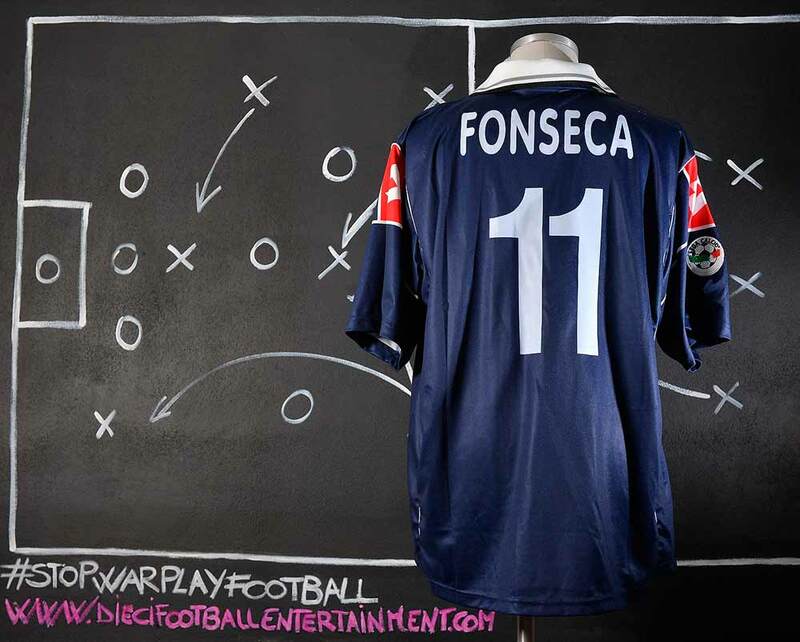 Fonseca was always regarded as a “super sub”, and scored several important goals coming off the bench. During his time with the Turin club, he won one Serie A title, a Champions League runner-up medal and the Supercoppa Italiana. 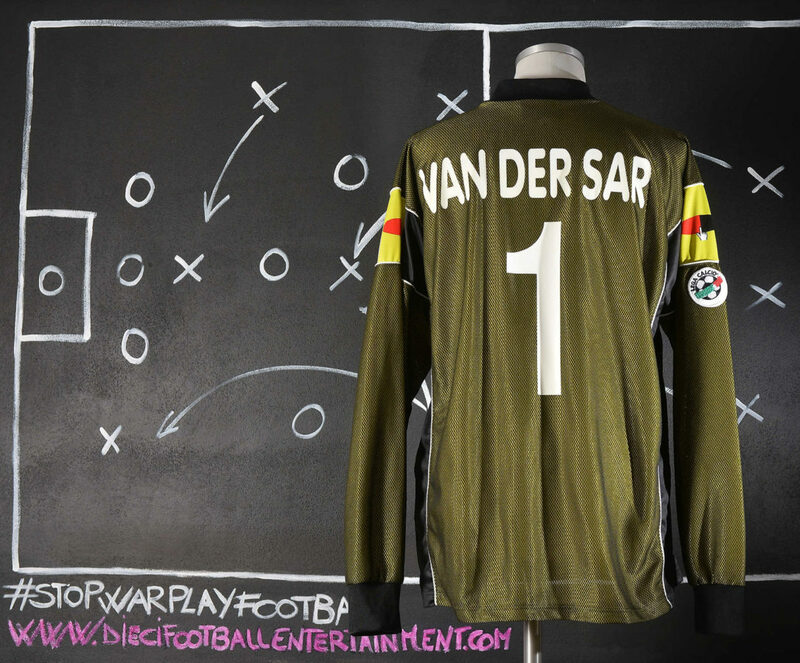 Regarded as one of the greatest and most complete keepers in football history, Van der Sar was a large, athletic, yet slender goalkeeper, who excelled at handling crosses due to his height and physique; an intelligent goalkeeper, in addition to his reflexes and shot-stopping, he was also known for his calm composure, and his ability to organise his defence. 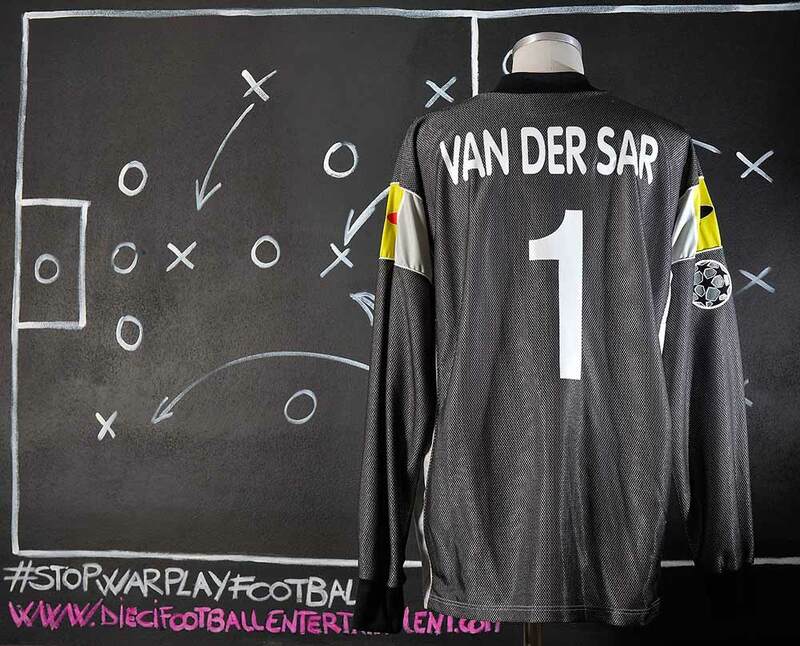 However, Van der Sar was known in particular for his skill with the ball at his feet, as well as his accurate distribution with either foot, which gave him the ability to launch counter-attacks from his area with long balls. 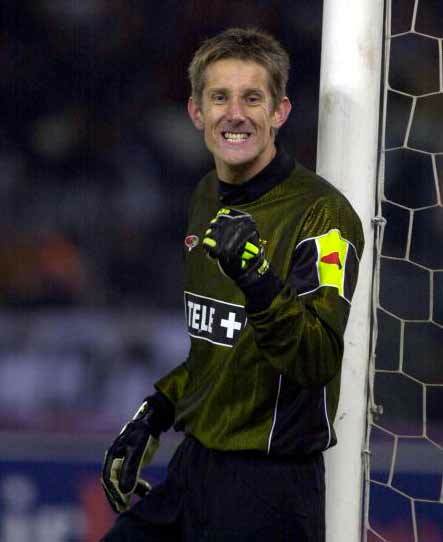 Due to his ability in possession, he also functioned as a “sweeper-keeper” on occasion throughout his career, in particular during his time with Ajax. 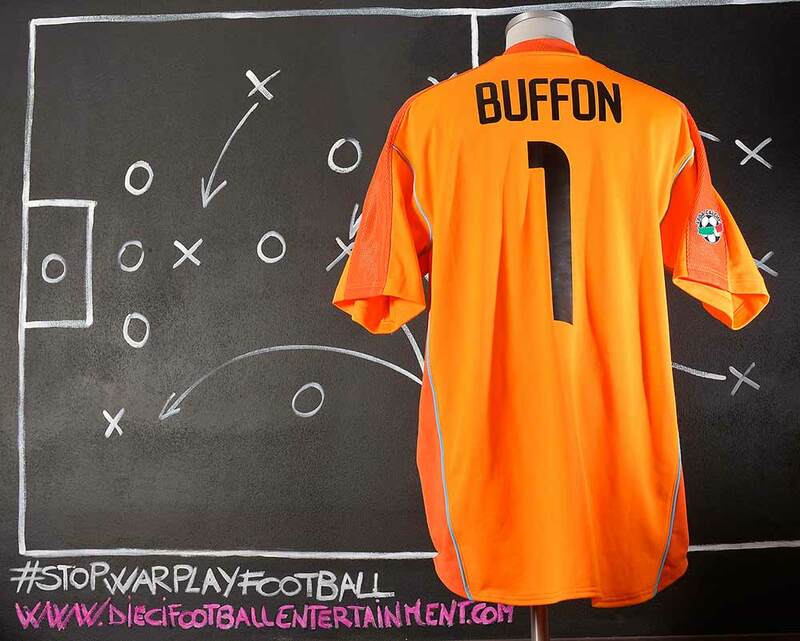 Van der Sar lost his place in the summer of 2001, after the Bianconeri purchased Italian international goalkeeper Gianluigi Buffon from Parma for 100 billion lire (approximately £32.6 million), a world-record fee for a goalkeeper. 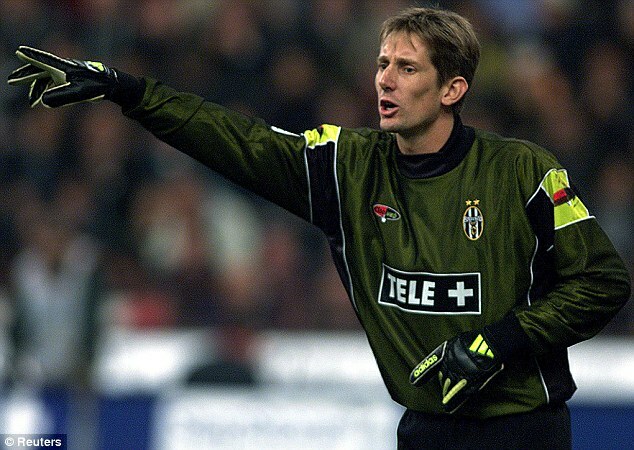 Unwilling to remain as second-choice behind Buffon, Van der Sar made it clear he wished to move on after two years in Serie A. His mistakes in the most important game of the season against Roma A.S. didn’t help him to renew the contract for the following season. This set was given to Juventus players to commemorate the Champions League game against Panathinaikos which took place in Athens on November 8th 2000. Panathinaikos defeated Juventus 3-1 and it was an historical game for the Greek team. 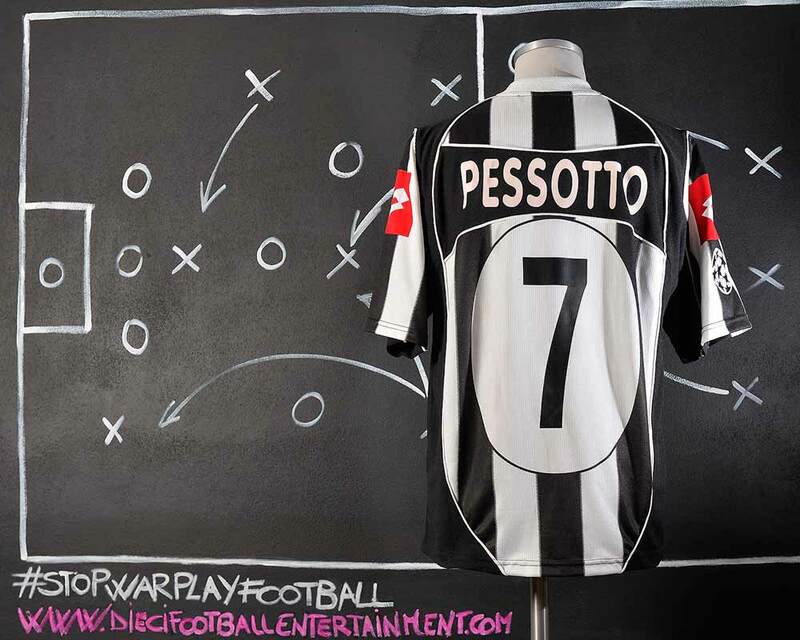 Del Piero was named Juventus captain upon Lippi’s return to Juventus, and he formed a formidable offensive partnership with French striker David Trezeguet, who joined in 2000, and Czech playmaker Pavel Nedvěd, who arrived in 2001. 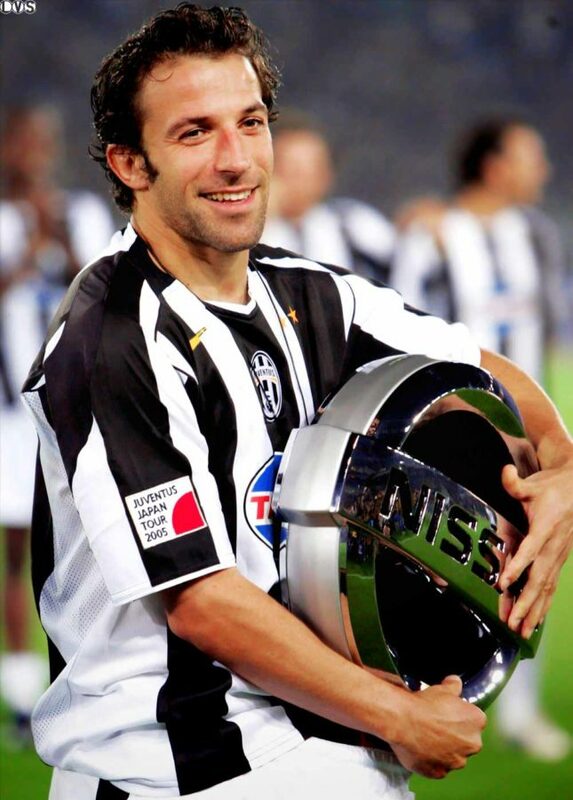 Del Piero scored 16 goals and provided several assists, as Juventus were crowned Serie A champions for a 26th time on 5 May 2002, the last match day of the season; Juventus won the title over Roma and Inter by a single point, after a 2–0 away victory over Udinese, with goals from top-scorer Trezeguet and Del Piero. 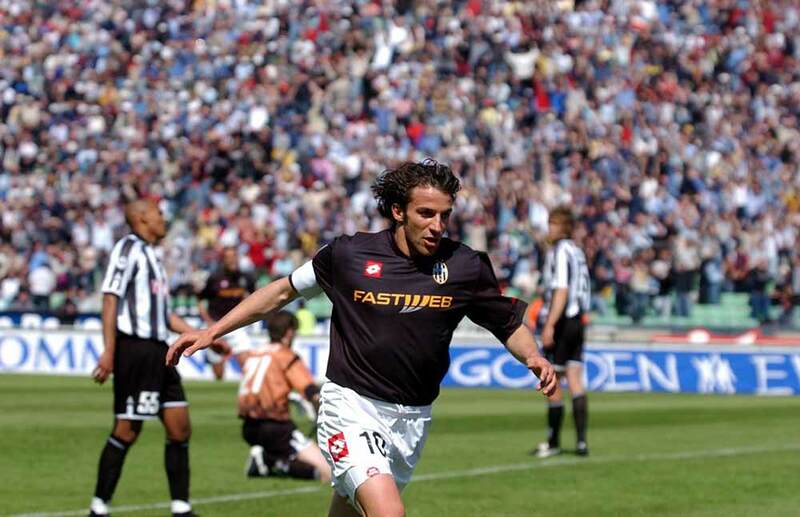 Del Piero managed 21 goals in all competitions, also scoring his 100th and 101st goals for Juventus that season, against Venezia, on 26 August 2001. 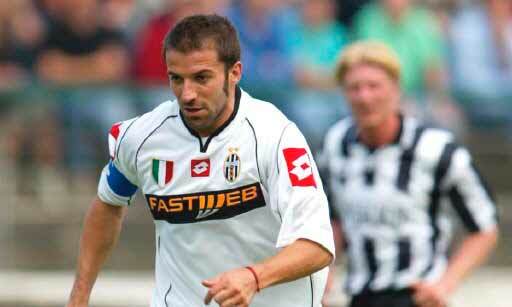 Del Piero also helped Juventus reach the Coppa Italia final that season, although Juventus were defeated by Parma. This model of shirt with flat TU MOBILE sponsor was only used against Celtic Glasgow. The regular model for the rest of the season had embossed TU MOBILE sponsor. 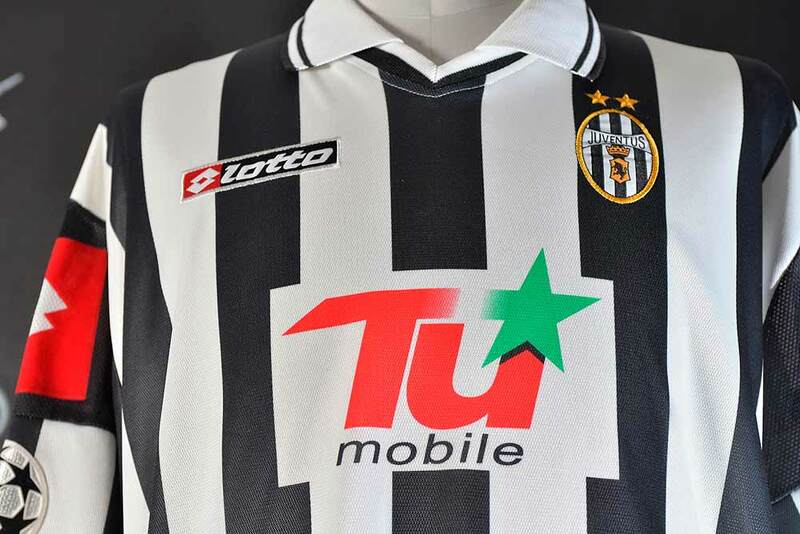 Juventus-Celtic was the first game of the Champions League 2001-2002. It supposed to be played on September 12th 2001. Due the terroristic attack to the World Trade Center in New York on September 11th, the game was postponed one week later. 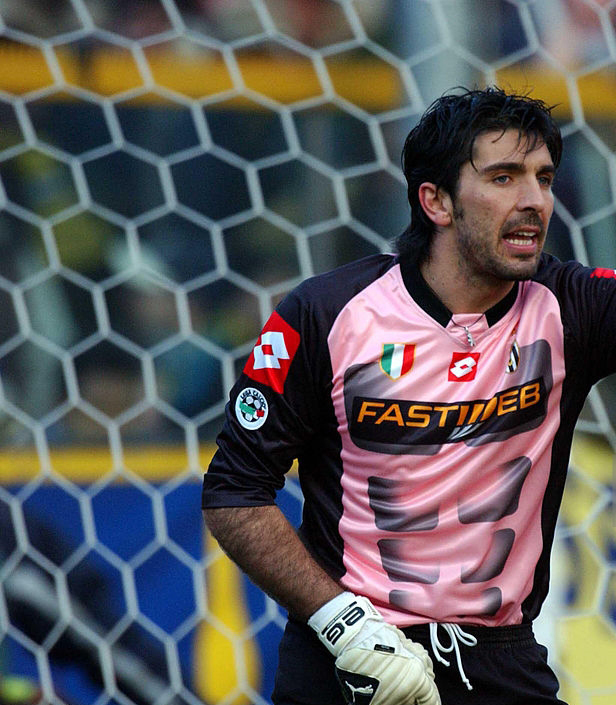 Enzo Maresca during the season 2001-2002 became the team fans idol. 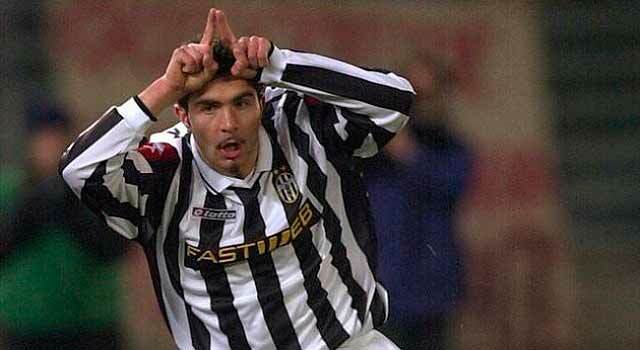 The reason was because he notably netted an important equaliser in the Derby della mole return leg, against neighbouring Torino FC; he attracted controversy when he celebrated the goal by mimicking Torino’s Marco Ferrante’s earlier “Bull-horn” goal celebration (the bull being a club symbol as it is Turin’s coat of arms, and the side also being known in its contracted form as “Toro”, bull in Italian). The 2002 Coppa Italia Final was the final of the 2001–02 Coppa Italia, the 54th season of the top cup competition in Italian football. 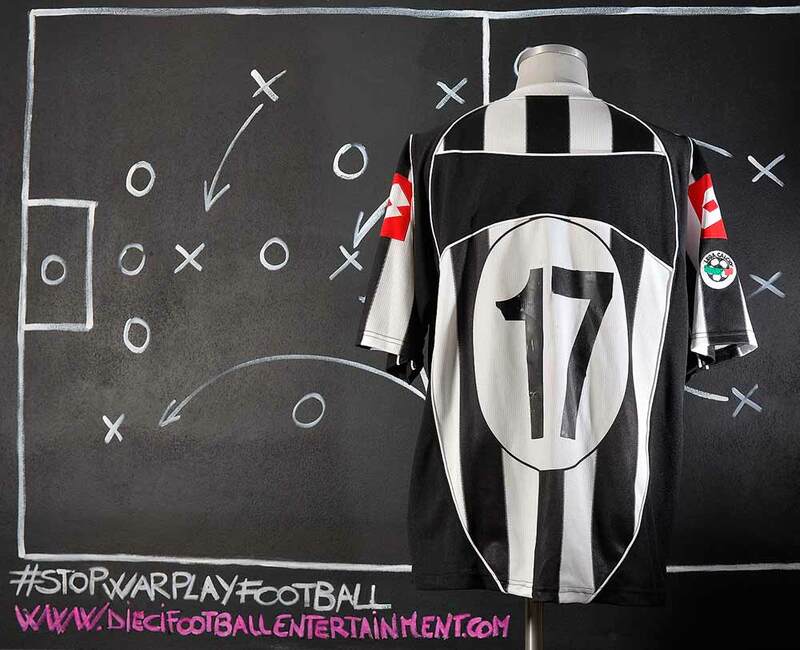 The match was played over two legs on 24 April and 10 May 2002 between Juventus and Parma. 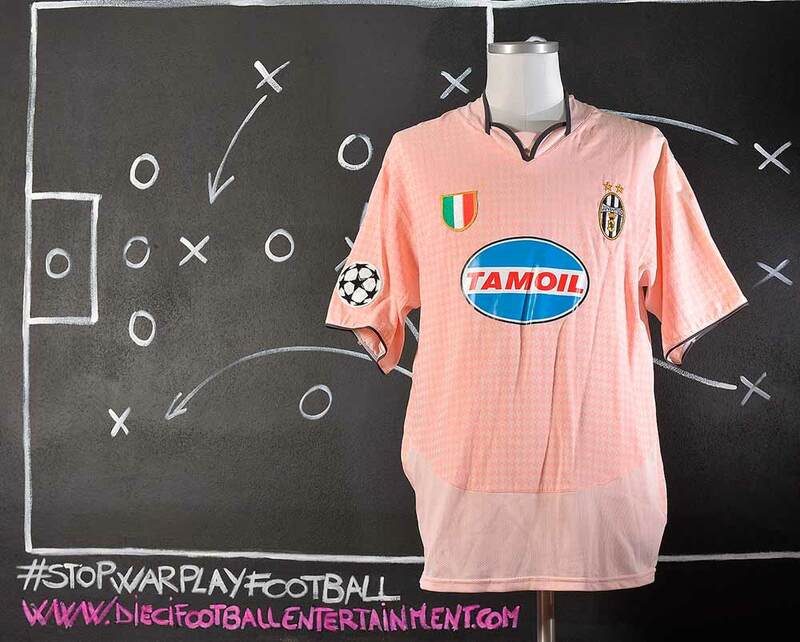 The final was won by Parma, who claimed their third Coppa Italia title with an away goals victory after the score was level at 2–2. This was the third Coppa Italia final between these two clubs, after the 1992 and 1995 finals, and the fifth of six major finals between the two sides. 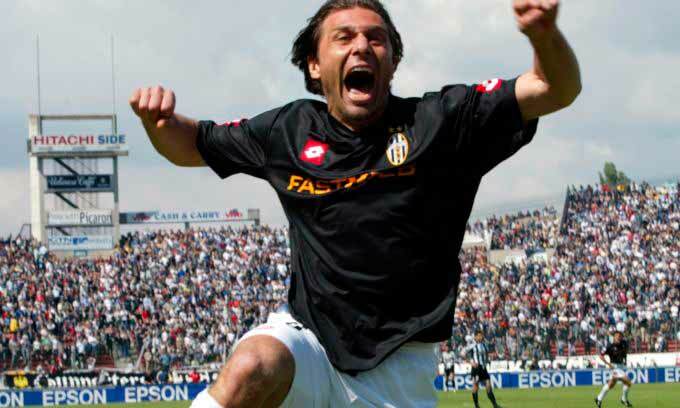 On 5 May 2002, Juventus completed a remarkable run to the Serie A title, thanks in part to a season-end collapse by Inter. It was the last day of the season and Inter had been at the top of the table since 24 March. 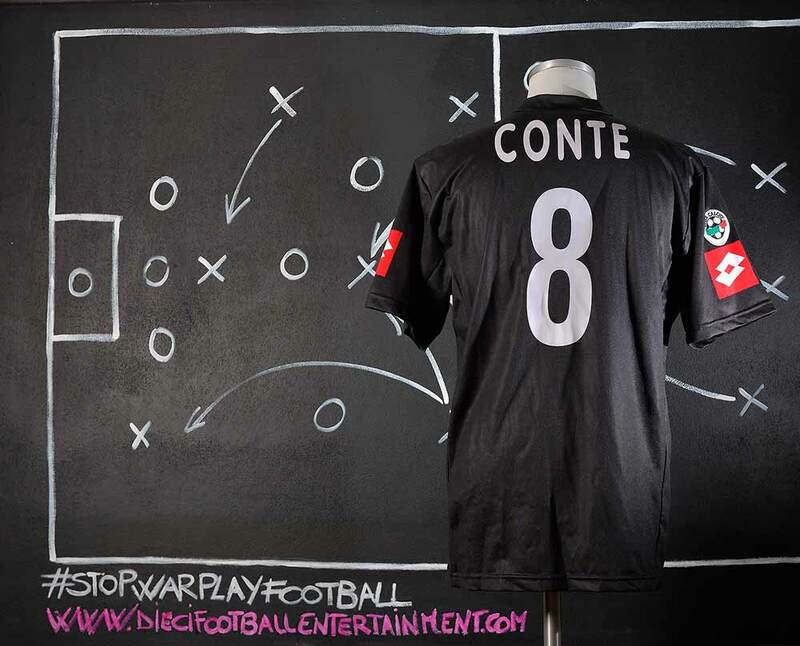 On 30 March, they had a six-point lead over Juventus, who were then in third, with Roma in between. But Juve went on an unbeaten run to climb into second, while an Inter loss to Atalanta and draw with Chievo saw their lead shrink to a single point. Roma had dropped to third, but were separated from the top by only two points. All three teams were away for their final matches of the season, Inter at Lazio, Juventus at Udinese, and Roma at Torino. In his pre-match conference, Roma manager Fabio Capello took a fatalistic approach to the day, saying that he expected all three teams to win, leaving the table unchanged. As it turned out, he was two-thirds correct. Both Juventus and Roma went on to win–0-2 and 0-1, respectively–but Inter fell hard to Lazio. Despite taking a 1-2 lead in the first half, they went into the break level at 2-2, then surrendered a pair of second-half goals to fall 4-2. The results pushed Juventus into first, Roma into second, and Inter into third. Since then the May 5th became a very important date for the Juventus fans and it especially became the date to fool Inter’s fans around. 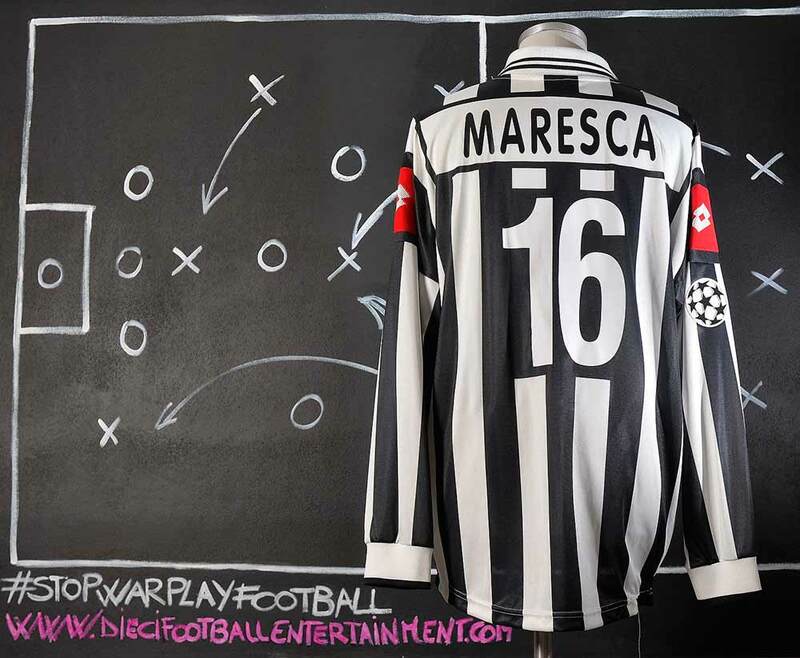 The highlights of Udinese-Juventus through the words of Juventus coach Marcello Lippi. 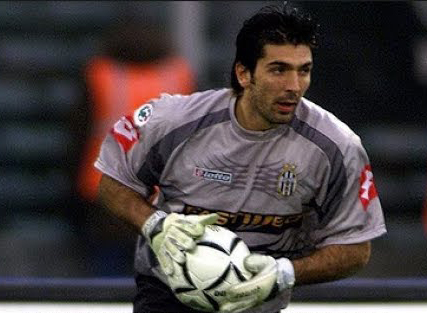 In the summer of 2001, Thuram made a transfer to Juventus, along with goalkeeper Gianluigi Buffon. 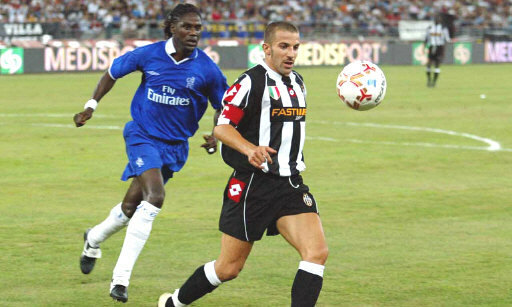 Thuram formed a defensive partnerships with the likes of Ciro Ferrara, Paolo Montero, Gianluca Pessotto, Mark Iuliano, Alessandro Birindelli, Igor Tudor, Gianluca Zambrotta, Nicola Legrottaglie, Fabio Cannavaro, Giorgio Chiellini, Federico Balzaretti and Jonathan Zebina during his five-year tenure with the club. 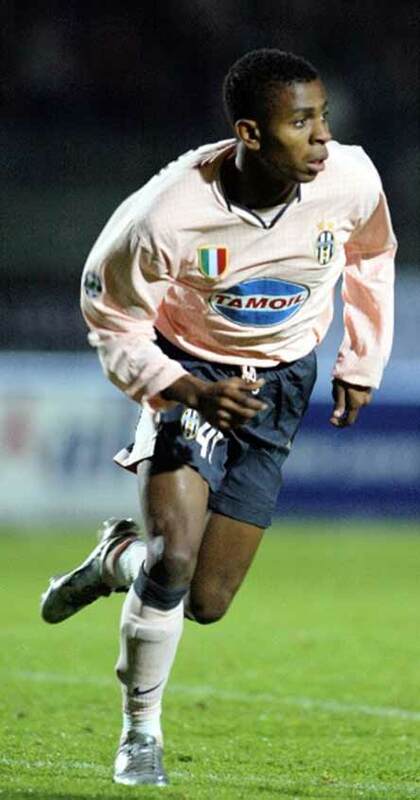 In his first season with the club, as a right back under Marcello Lippi, Thuram won the 2001–02 Serie A title, also reaching the final of the 2001–02 Coppa Italia. 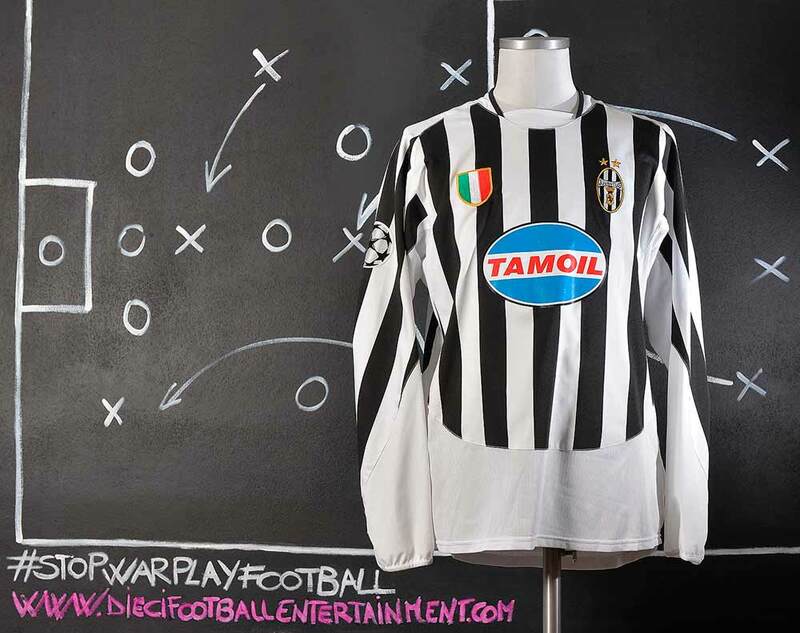 Juventus started the following season by winning the 2002 Supercoppa Italiana, and defended their Serie A title, also reaching the UEFA Champions League final, where they were defeated by rivals Milan on penalties. 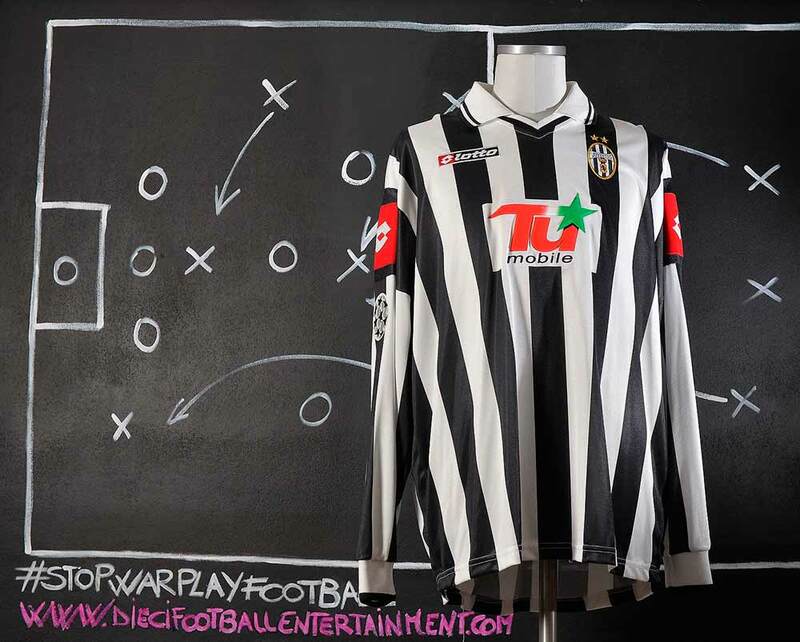 Juventus won the 2003 Supercoppa Italiana the following season, reaching another Coppa Italia final, but finished in a disappointing 3rd place in Serie A, and failed to progress past the second round in the Champions League. 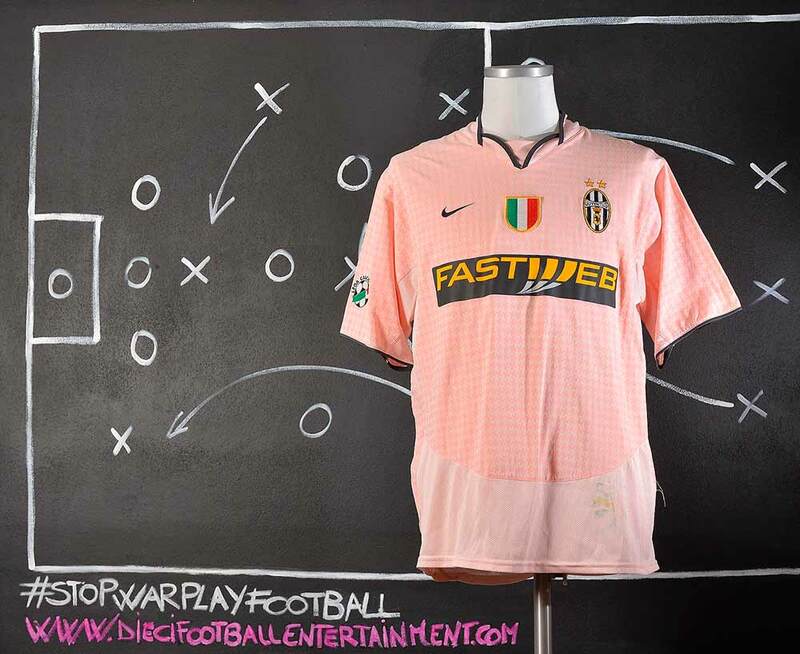 During the 2004–05 and 2005–06 seasons under coach Fabio Capello, Thuram, along with Fabio Cannavaro in the centre of defence, with Gianluigi Buffon in goal, Gianluca Zambrotta at left back,, and Jonathan Zebina at right back formed one of the most expensive, but also most feared, defences in Europe and Italy. 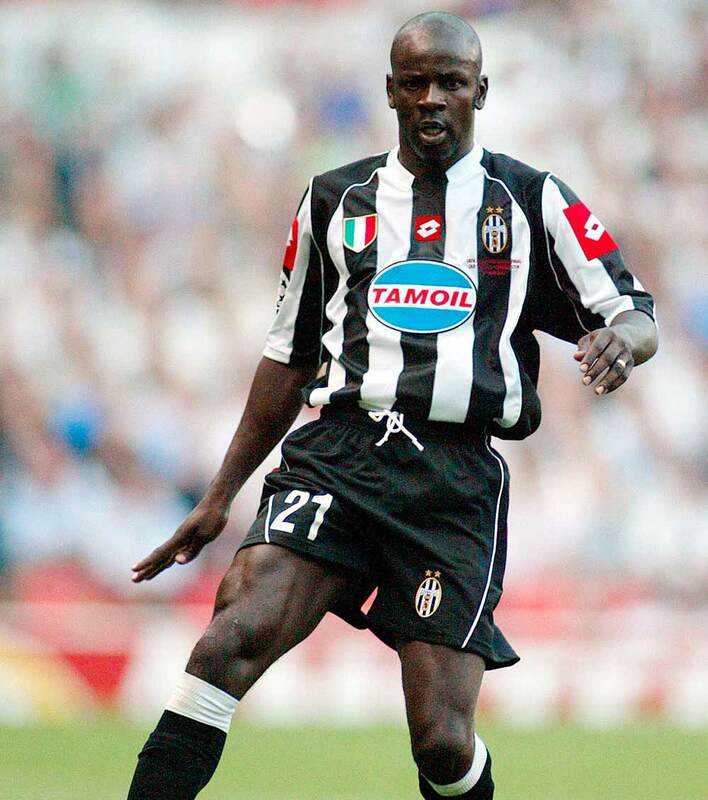 During these next two seasons with the club, Thuram won the Scudetto two more times with Juventus, although these consecutive league titles were later revoked due to Juventus’ involvement in the 2006 Italian football scandal (calciopoli). After five years with Juve, Thuram transferred to Barcelona in the Spanish La Liga, in the wake of the calciopoli scandal. He managed over 200 total appearances for the club, with two goals. 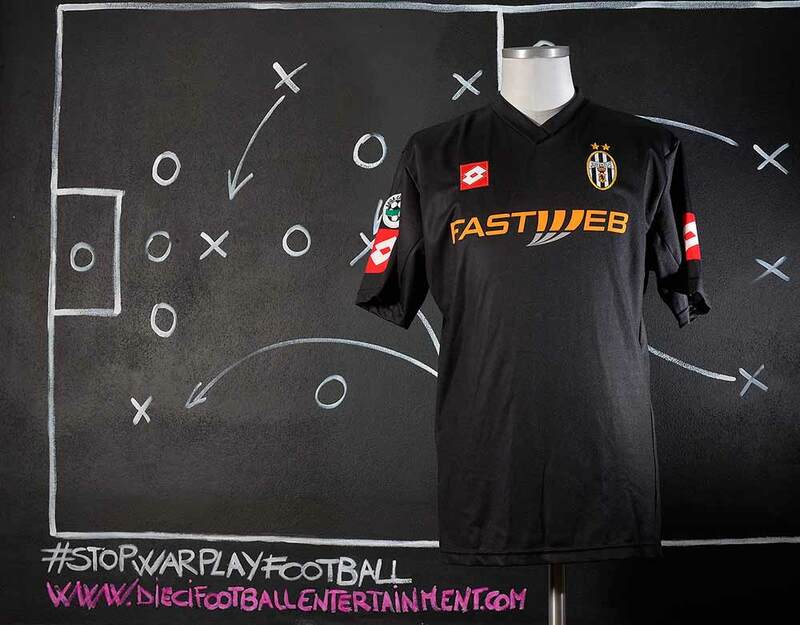 This away model was not used in the Final against Parma. In both games the team played with regular home shirt. This same model was previously used during regular Italy Cup’s games. 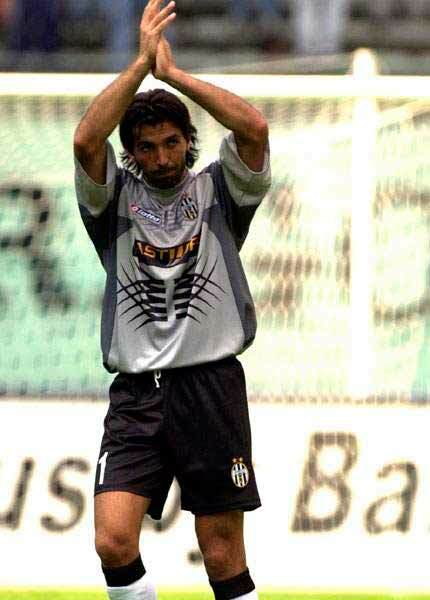 2001-2002 was the Buffon first season with Juventus F.C. 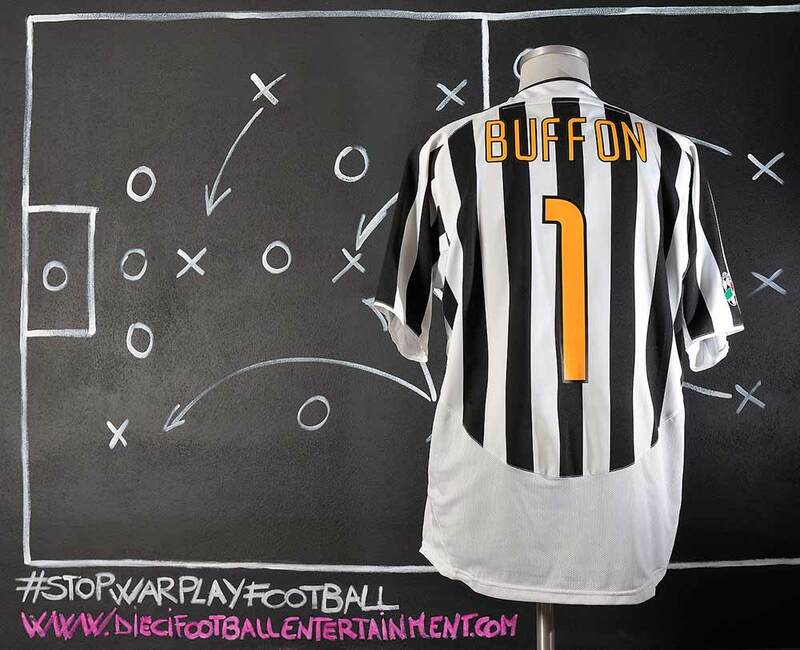 Buffon was acquired by Parma for a world-record goalkeeper’s transfer fee of 100 billion lire (€53 million). 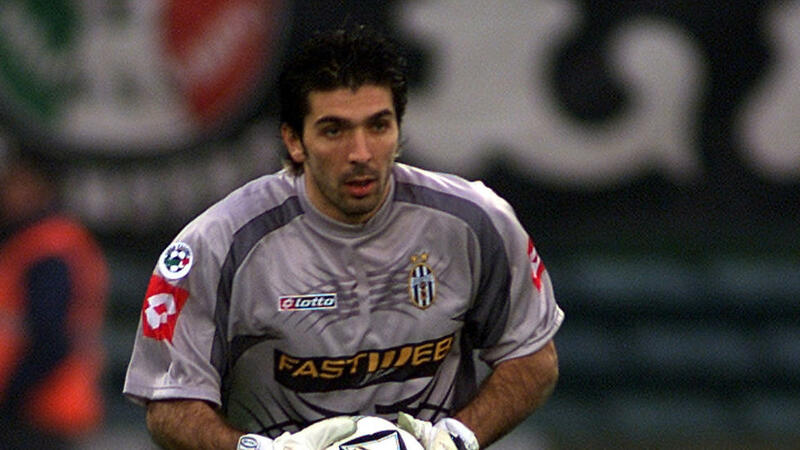 Buffon transferred from Parma to Juventus along with former Parma teammate Lilian Thuram, and was handed the number 1 shirt as the starting goalkeeper, replacing Edwin van der Sar, who was sold to Fulham. 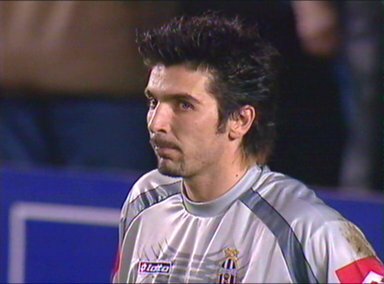 Buffon later said that there had been an initial possibility for him to join Roma, and although negotiations were ongoing with Barcelona, he chose Juventus because his father convinced him he would be likely to achieve his ambition of winning the Scudetto. 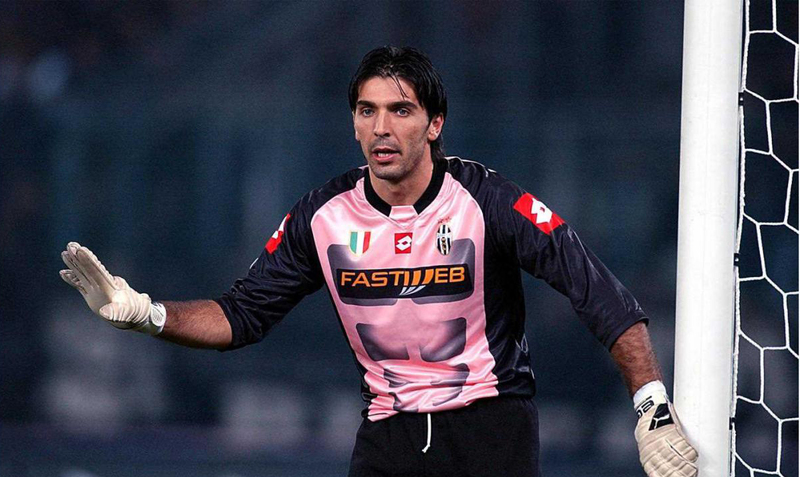 This transfer fee made Buffon Juventus’s most expensive purchase ever. A serious injury occurred to Alessandro Del Piero during this season. He missed two months of football following that injury but he was able to be the team top scorer with 16 goals during the season. 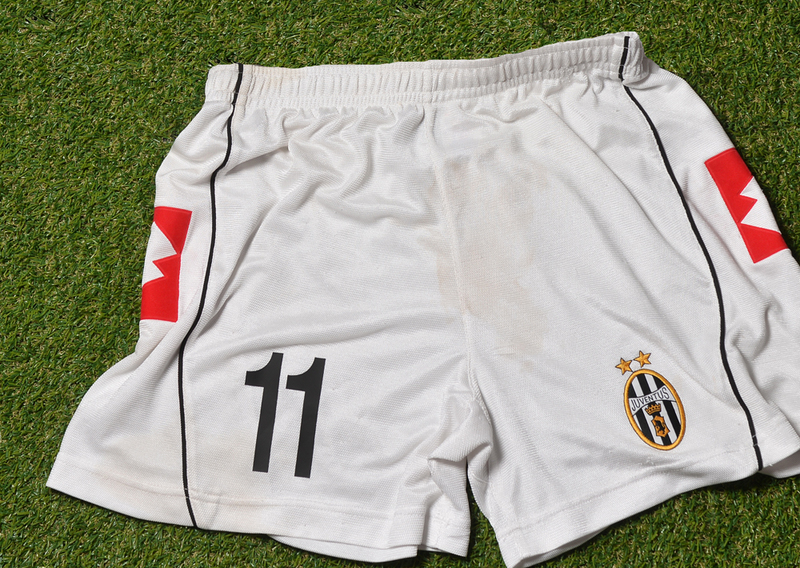 Along with the two Milan clubs, Juventus were one of the three Italian sides who appeared in the semi-finals that season. Juventus knocked out the only remaining non-Italian team, Real Madrid, to set up an all-Italian final with Milan, who had beaten Inter in the other semi-final. The final, played at Old Trafford in Manchester, ended 0–0, with Milan winning on penalties. 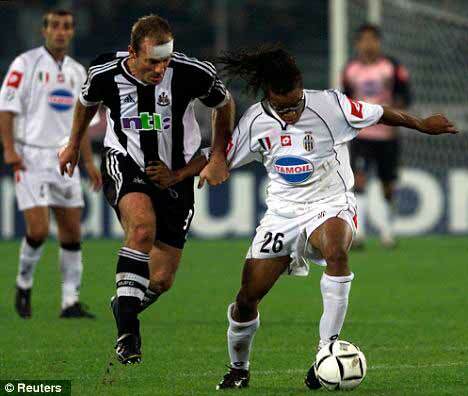 Normally reliable goalscorer David Trezeguet was among the players who fluffed their attempts. 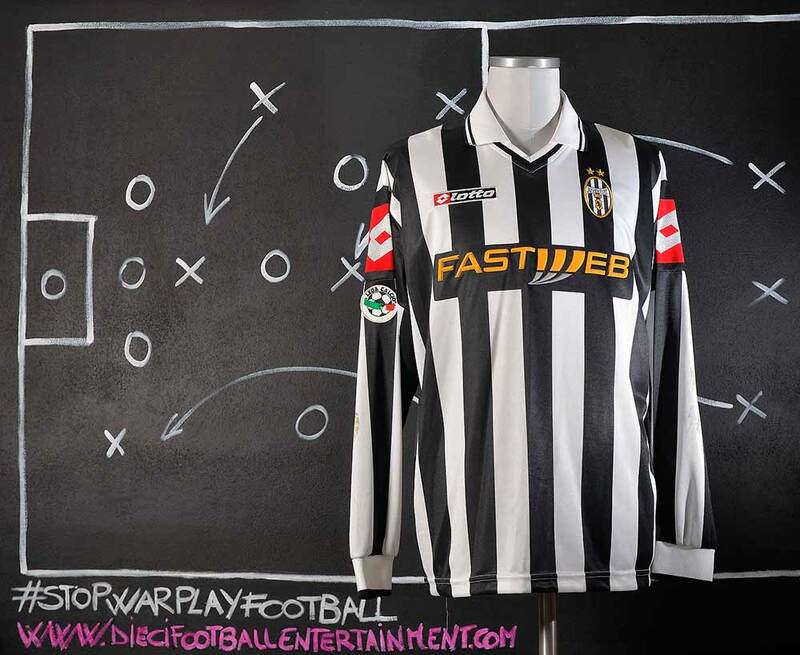 It was Juventus’s best run in the competition since the 1997–98 season, where they had also been beaten finalists. However, the Bianconeri’s run to the final wasn’t exactly a case of plain sailing, and actually involved a lot of tough moments. After impressing in the first group stage, topping their group and conceding just 3 goals in 6 games (the meanest defence of all 32 teams competing), Juventus suffered in the second group stage. Drawn in Group D alongside FC Basel, Deportivo La Coruña, and Manchester United, Juventus began their campaign disastrously, conceding two early goals in La Coruña. The Italians managed to fight back with goals from Alessandro Birindelli and Pavel Nedvěd, but the problems encountered in this fixture would set the tone for the remainder of this group stage. Having beaten Swiss side Basel 4–0 in Turin in December, the Bianconeri were to face Manchester United in their next two games. The first match, played in Old Trafford, saw Juventus send a depleted squad to England after many players caught flu. 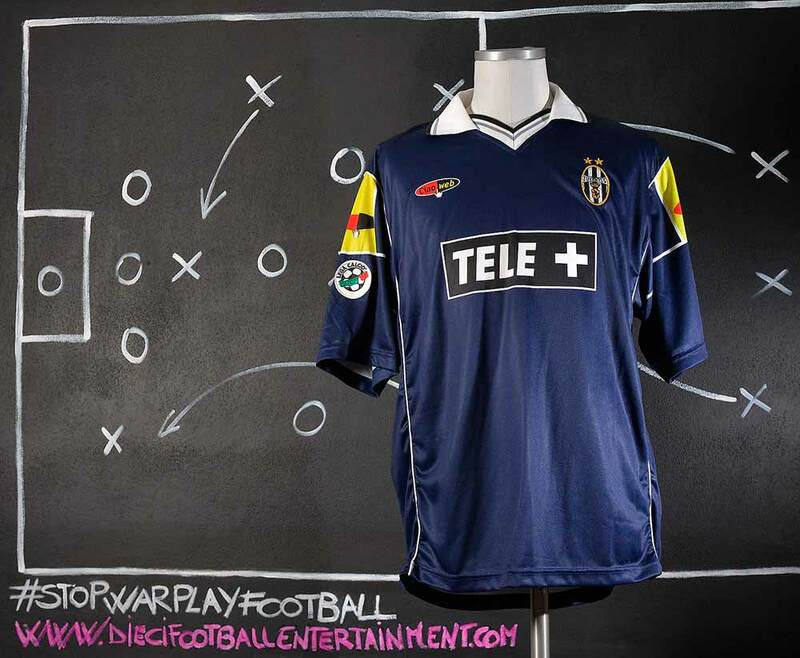 In spite of this, the Turin club put up a spirited display and only lost 2–1. They were widely expected to make amends in the return leg at the Stadio delle Alpi; but, in front of 59,000 spectactors, the home side collapsed to a 3–0 loss. It was the first time in six Champions League encounters that Juventus had failed to score against United. In the meantime, both Basel and Deportivo had managed to win games, meaning the Italian champions faced an uphill struggle to reach the quarter-finals. In the following game, against Deportivo, Juve were facing the prospect of an early exit with both sides tied at 2–2 and mere minutes remaining. 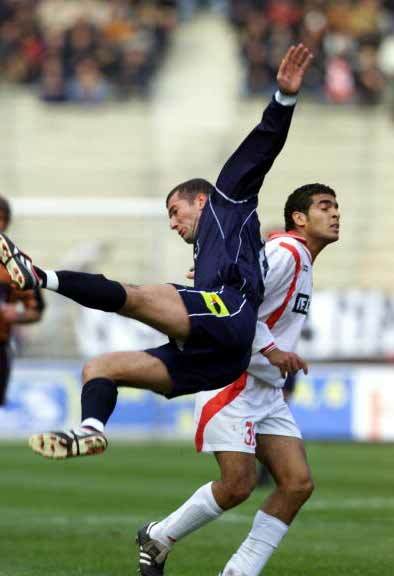 In injury time, Igor Tudor unleashed an unstoppable volley that beat Deportivo keeper José Molina. The victory meant Juventus had a superior head-to-head record against the Spaniards and could only eliminated if they lost their last game in Basel by more than 4 goals. The game was indeed lost, but only by 2–1, giving the Turin side its first quarter-final appearance in the Champions League since the 1998–99 season. More epic games awaited them, with Barcelona next on their agenda. While struggling in their domestic league, Barcelona had impressed in both group stages, topping their group every time and establishing a new record of nine consecutive wins in the competition. 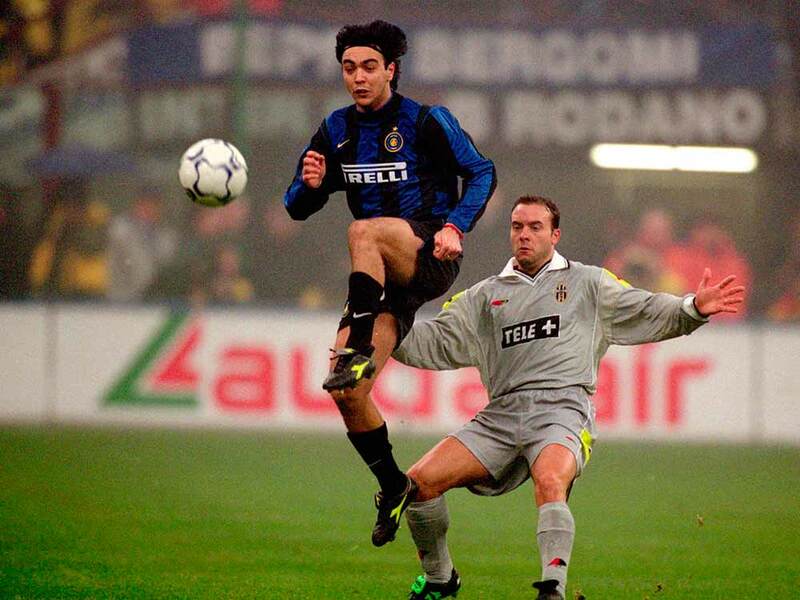 The first leg of the quarter-final in Turin finished 1–1, Javier Saviola’s 78th-minute goal equalising Paolo Montero’s early goal. Barcelona appeared to be in a fine position heading into the second leg at the Camp Nou. 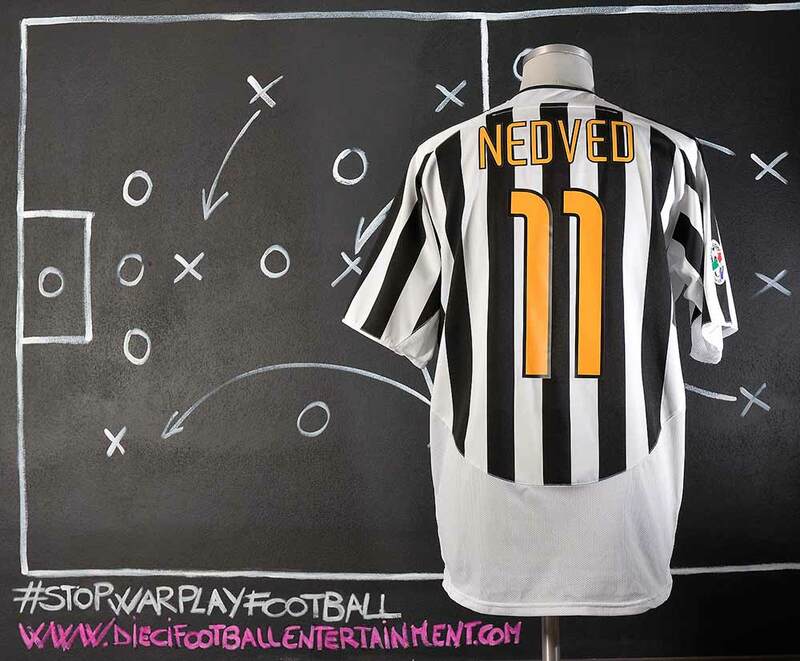 There, Pavel Nedved scored first for Juventus, but the Catalans soon equalised through Xavi. 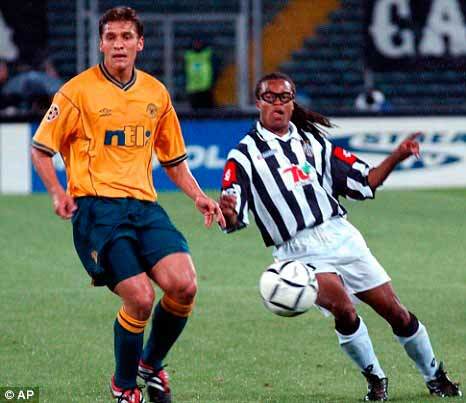 When Edgar Davids was sent off for repeated fouling the Bianconeri were seemingly doomed, but they held on until extra time; with six minutes left on the clock, substitute Marcelo Zalayeta shocked the Camp Nou with a second goal. 10-man Juventus qualified for the semi-finals, following a game that ranks forever among the club’s greatest European exploits. Even tougher opposition was awaiting them in the following round. Real Madrid had won three of the previous five editions of the competition and presented a star-studded squad with players such as Iker Casillas, Roberto Carlos, Luís Figo, Raúl González, Ronaldo and former Juventus playmaker Zinedine Zidane. They had imperiously seen off the challenge of Manchester United in the quarter-final and were in search of their 10th Champions League title. The first leg was played in Madrid on 6 May. 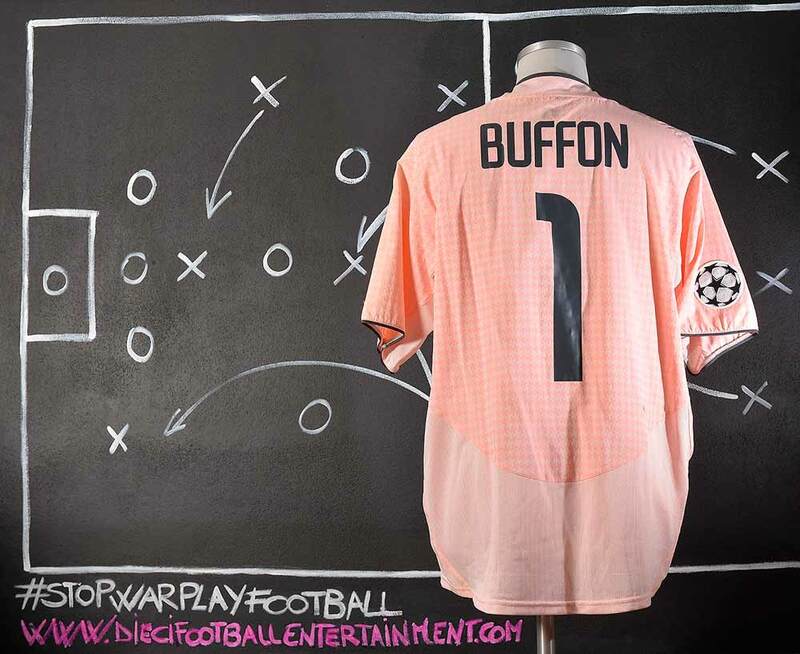 Deploying their usual brand of quick attacking football, the Spaniards put their noses in front with a Ronaldo strike and continued to dominate proceedings, Gianluigi Buffon doing well to save a Zidane free-kick. However, on the stroke of half time, David Trezeguet silenced the Santiago Bernabéu with an equaliser. The second half saw Real continue to dominate, but with much less success than they had against Manchester United in the previous round. Roberto Carlos did grab a second goal for the home side, but the Juventus performance had sown the seeds of doubt in the previously confident Madridistas. The return leg on 14 May turned out to be a completely different affair. Criticised for their defensive approach in Madrid, Juventus set out to attack on their home turf and were rewarded for their efforts with just 12 minutes gone. 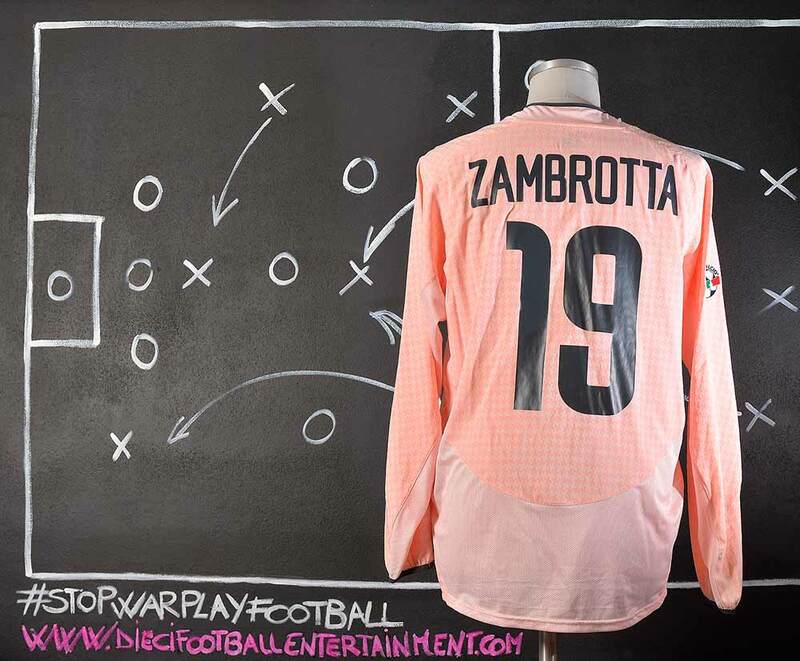 A fine collective move saw Gianluca Zambrotta cross from deep for Alessandro Del Piero, who headed back into the six-yard box for David Trezeguet to smash home. Madrid were all over the place and found no response to the Italians’ unexpected all-out attack attitude. 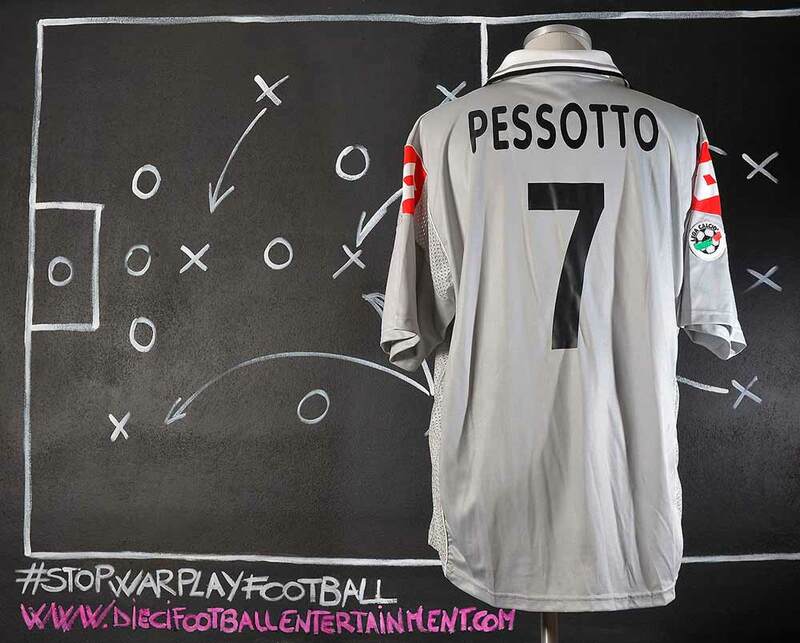 Just before half time, Alessandro Del Piero tormented the Real Madrid defence in their own penalty area with his twists and turns, and beat Iker Casillas at his near post with a well-placed shot. 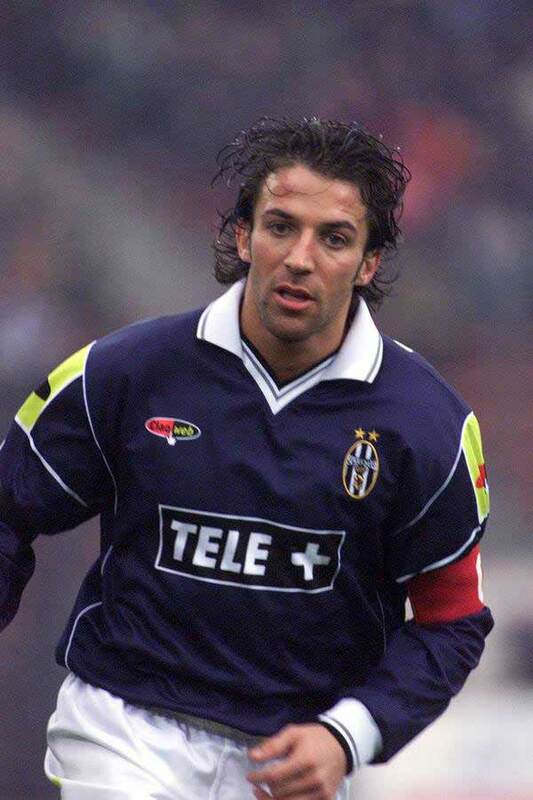 Del Piero thus maintained his tradition of scoring key goals against Real Madrid, having already done so as a 21-year-old in a 1996 quarter-final tie. The Spaniards played better in the second half and earned a penalty after 65 minutes. Gianluigi Buffon delivered a rare penalty save to deny Luís Figo, thus keeping his side’s two-goal advantage. On 73 minutes, Pavel Nedvěd delivered the final nail into Madrid’s coffin with a thunderous volley that beat the hapless Casillas. Unfortunately, he was booked for a silly foul minutes later, meaning he would miss the final through suspension. 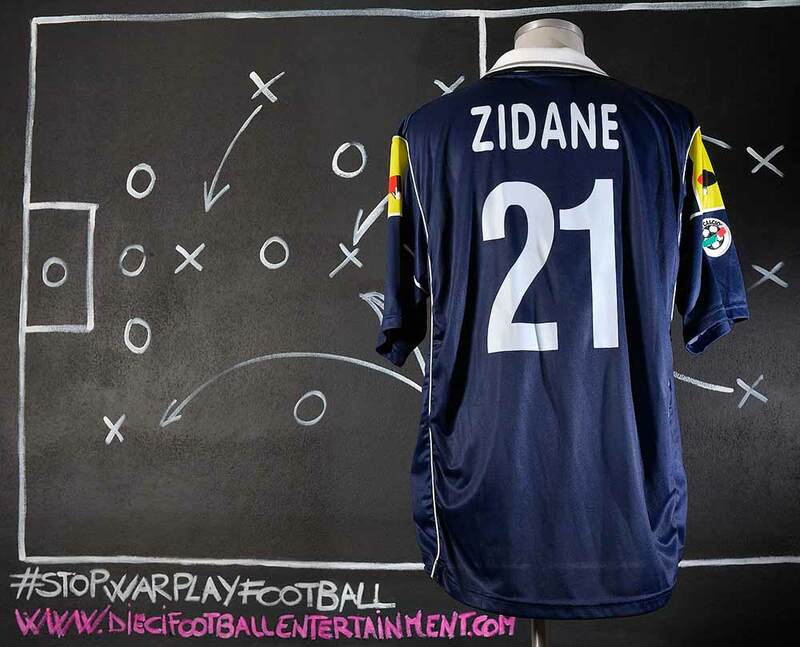 On 89 minutes, Zidane, playing on the pitch which had been his home for five seasons, pulled one back for Real Madrid, but the Spaniards ultimately got what they deserved, having been comprehensively outplayed by their opponents. Watch Barcelona-Juventus, Champions League quarter-final highlights. Watch Juventus-Real Madrid, Champions League semi-final highlights. 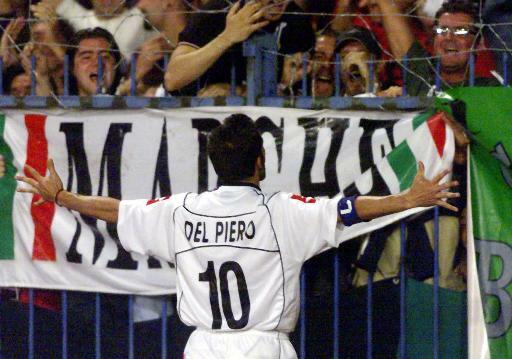 Alessandro Del Piero after he scored against Real Madrid in the second leg of the semi finals. The 2003 UEFA Champions League Final was a football match that took place at Old Trafford in Manchester, England on 28 May 2003 to decide the winner of the 2002–03 UEFA Champions League. The match was contested by two Italian teams: Juventus and Milan. The match made history as it was the first time two clubs from Italy had faced each other in the final. It was also the second intra-national final of the competition, following the all-Spanish 2000 UEFA Champions League Final three years earlier. Milan won the match via a penalty shoot-out after the game had finished 0–0 after extra time. Old Trafford, the home of Manchester United, was selected to host the match in December 2001, following a meeting of the UEFA Executive Committee in Nyon, Switzerland, at the same time as Estadio de La Cartuja in Seville was selected to host the 2003 UEFA Cup Final. It was selected ahead of the likes of the Santiago Bernabeu Stadium in Madrid, the Stade de France in Saint-Denis near Paris, and the Amsterdam Arena. 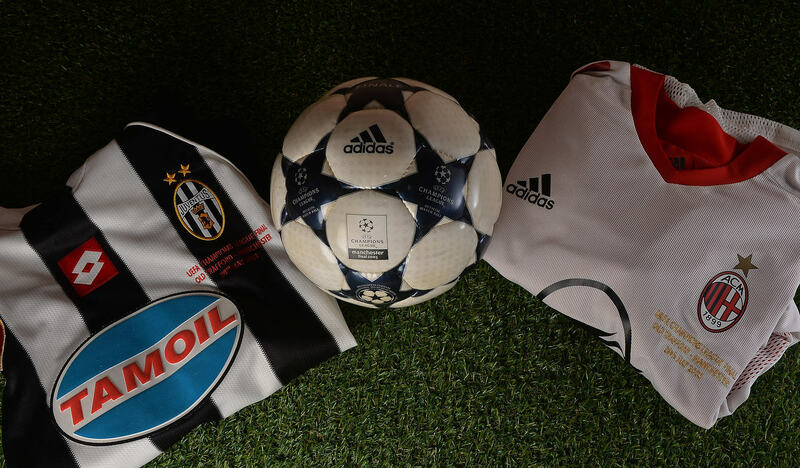 Champions League 2003 Final Match Worn Shirts and Game Used Ball. In the semi-final against Real Madrid Pavel Nedved picked up a second yellow card which meant he was suspended for the final. 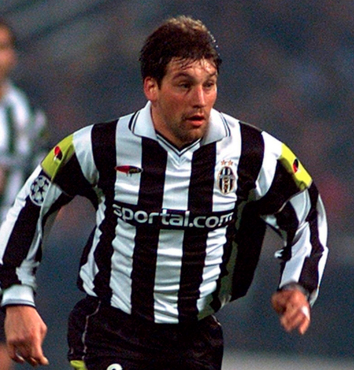 During the Final instead both Juventus and Milan had injuries to defenders, Juventus’ Igor Tudor leaving early in the first half after pulling a muscle in his right thigh. In extra time, Roque Júnior limped out due to fatigue and injury; as they had made all three of their allowed substitutions, they had to play the rest of the game with 10 men. The penalty shoot-out has caused controversy among some fans as replays showed that Dida was in front of the goal line when saving penalties from David Trezeguet, Marcelo Zalayeta and Paolo Montero. 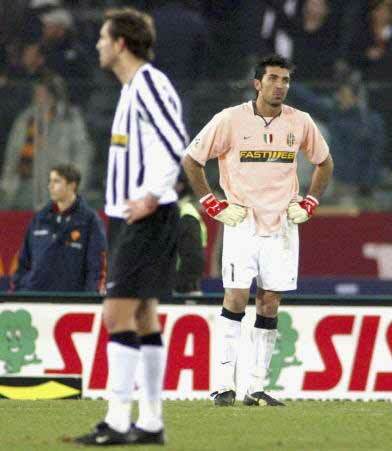 Buffon was also off his line when saving penalties from Clarence Seedorf and Kakha Kaladze. 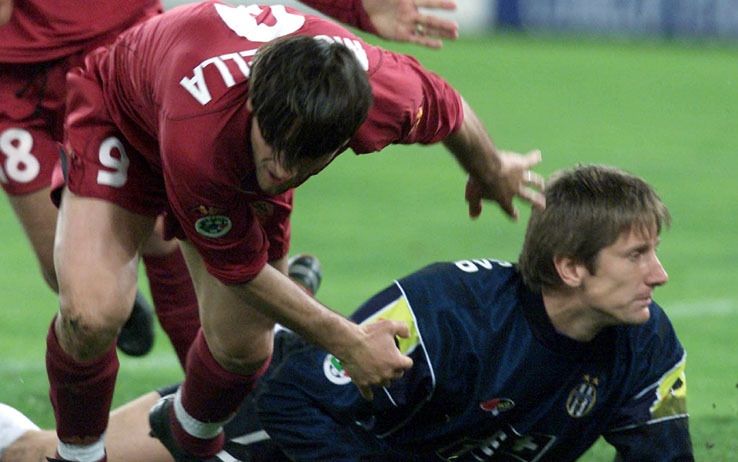 Shevchenko put away the final penalty to win the European Cup for Milan for the sixth time. Shevchenko himself became the first Ukrainian footballer to win the European Cup. The Adidas Finale is a brand of football made by Adidas. It is the current official football of the UEFA Champions League, after Adidas took over the contract of official supplier from Nike in 2000. The internal and external design of the ball changes reflecting improvements to football technologies taken from other Adidas-produced footballs. The external design is the “Starball” based on the stars of the UEFA Champions League logo. Each year’s ball keeps the branding name of Adidas Finale, excepting suffixes to designate the year. During its introduction the Adidas Finale was only used in the latter stages of Champions League competition; it was not uncommon to see other balls in the early rounds, usually provided by the uniform manufacturer or the supplier for the domestic league of the home team, including other Adidas balls. 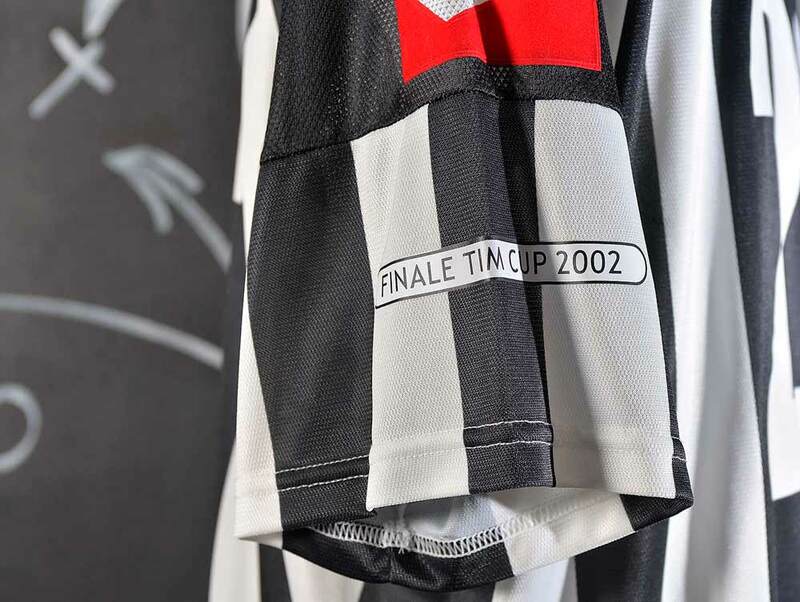 However, from 2006–07, the Adidas Finale had been used in all stages of the competition, including the play-off round which was introduced in 2009–10. The ball is made by Adidas as the German brand took over the contract from Nike in 2000, and was firstly developed based on the Adidas Terrestra Silverstream, the official matchball of the UEFA Euro 2000 in the Netherlands and Belgium. This ball was also made with the same type of materials and construction used for the Adidas Fevernova, except, of course, the graphics. The Finale ball incorporates a unique design that was inspired by the UEFA Champions League “starball” logo. The Finale is softer, faster, and more accurate than any other Adidas football before and it also features a layer of highly compressed, gas-filled micro-balloons of equal size (syntactic foam), proven during Euro 2000 and probably contributing to one of the highest average goal rates in a major tournament. Each season in the Champions League, the colour of the stars on the ball is changed. The first ball, in 2000–01 was silver, followed by black in 2001–02, then dark blue in 2003–04, and red in 2004–05. This was followed by light blue in 2005–06. The design for next season’s ball was used in this season’s final. A light blue ball was used for most of the 2005–06 season, but in the final between Arsenal and FC Barcelona, held in the Stade de France, Paris it was replaced by a ball with the same paneling as the Adidas +Teamgeist but decorated with pink stars. For the 2006–07 season, the ball had grey stars trimmed in red and white and the Finale Athens ball is a chrome silver metallic with royal blue and white. For the 2007–08 season, the ball was decorated in tangerine orange and black stars with grey trim. For the final of the 2007–08 season in Moscow, the ball was gray and red stars with a gold trim, while the ball’s paneling was still same with +Teamgeist, but with PSC-Texture which based on Adidas Europass. The match ball used for the 2008–09 season was black and white with a green trim. For 2009-10, the star-ball’s based panels is being used. 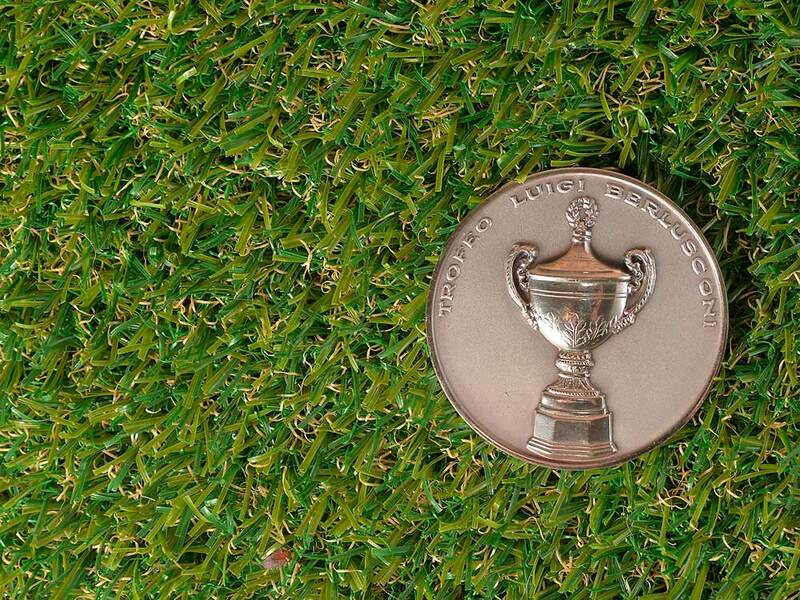 Each match ball intended for use in the final is marked with the location at which the final match is to be played. 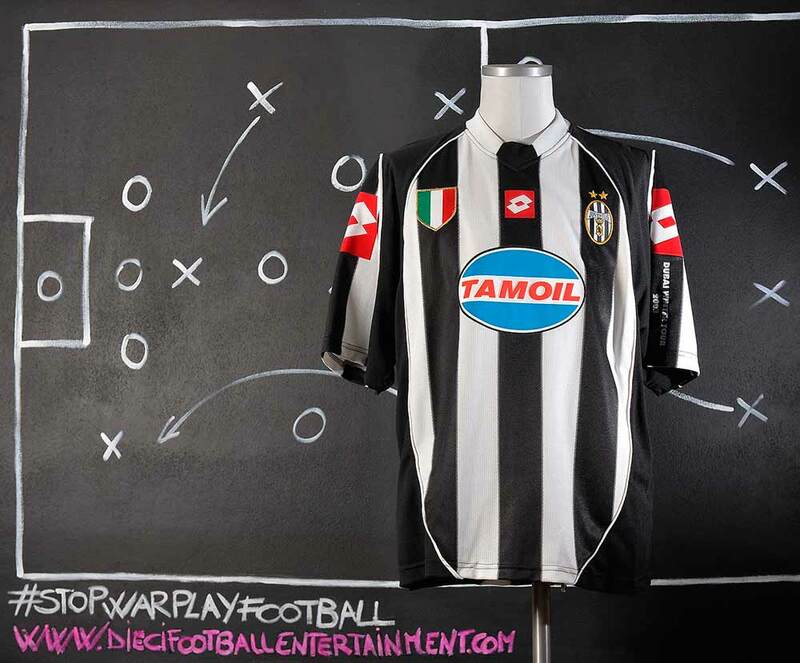 The 2002 Supercoppa Italiana was a match contested by Juventus, the 2001–02 Serie A winner, and Parma, the 2001–02 Coppa Italia winner. 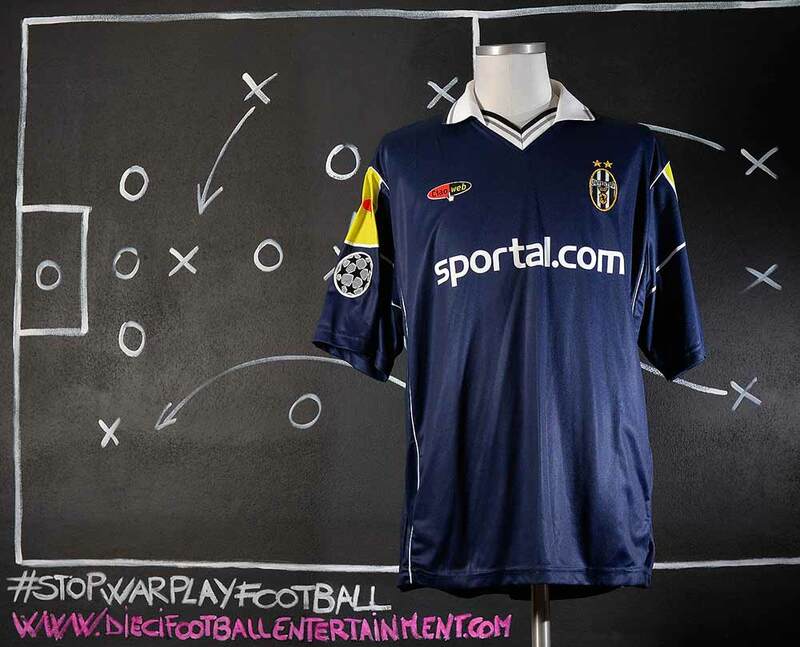 It was the fifth appearance for Juventus (2 victories in 1995 and 1997) and the fourth for Parma (victory in 1999). 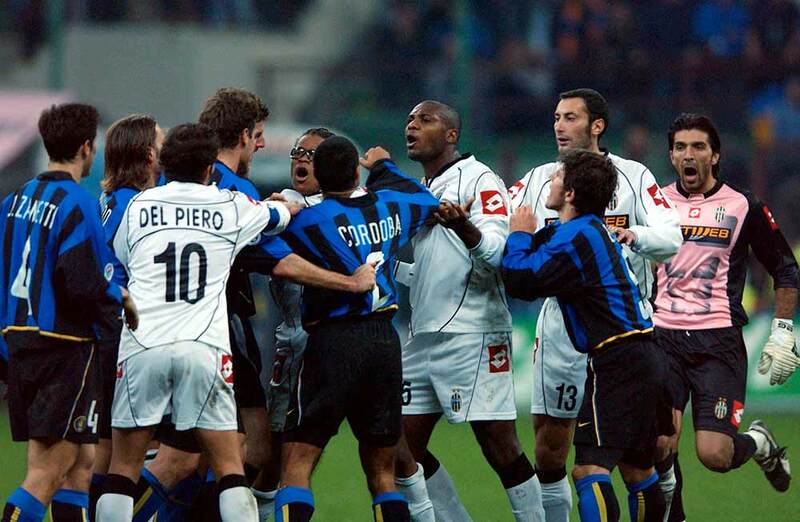 The teams had already faced each other in the 1995 Supercoppa. The match was played in Tripoli, Libya. 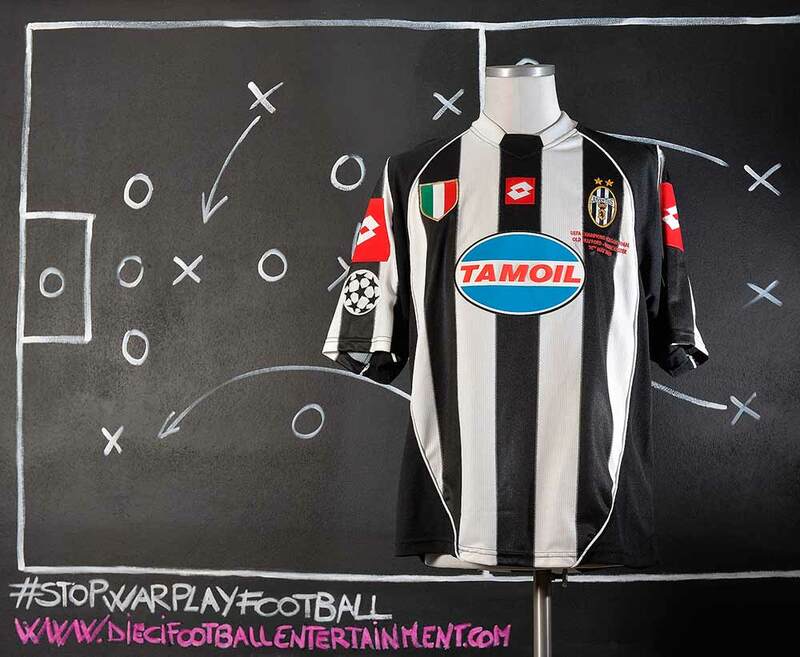 This is the only competion where the team played with flat TAMOIL sponsor. All of the other competitions were played with embossed Tamoil sponsor. 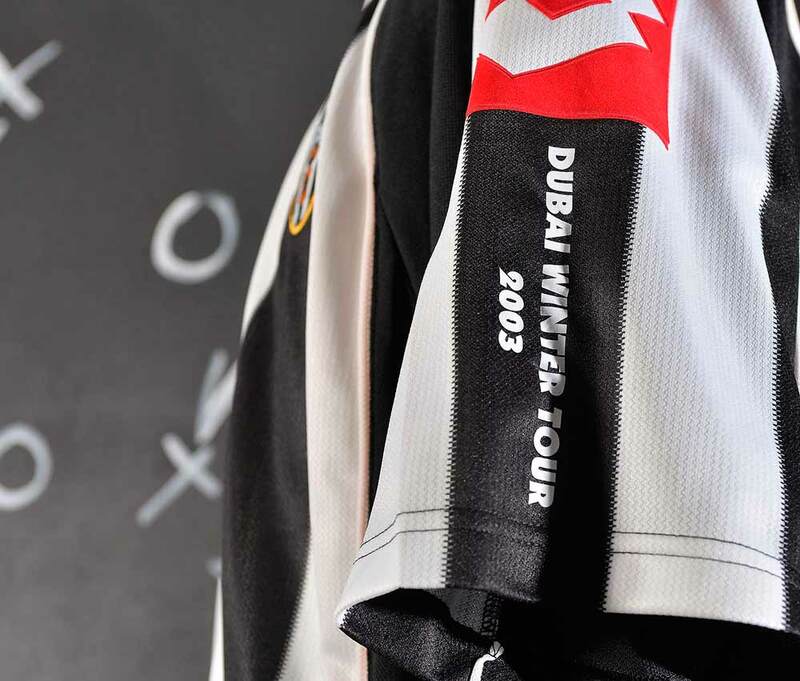 In the first days of 2003 the team attended a short tour in Dubai. This shirt comes from the friendly game against Al Ain which took place in Dubai on January 5th. On the field, the side coached by Marcello Lippi had a relatively slow start to the league season. They remained unbeaten in the first 12 games, but this included five draws. The club’s form suffered a blip at the beginning of autumn with two draws and two consecutive defeats, to Brescia and Lazio, between 23 November and 15 December. At this point of the season, with 14 games played, Juventus were fourth in Serie A, trailing Inter, Lazio and AC Milan. On 22 December, a late Mauro Camoranesi goal at Perugia was needed to put an end to this winless streak. From this moment on, the Bianconeri gained a momentum they sustained going into the new year, winning nine of their next ten games. 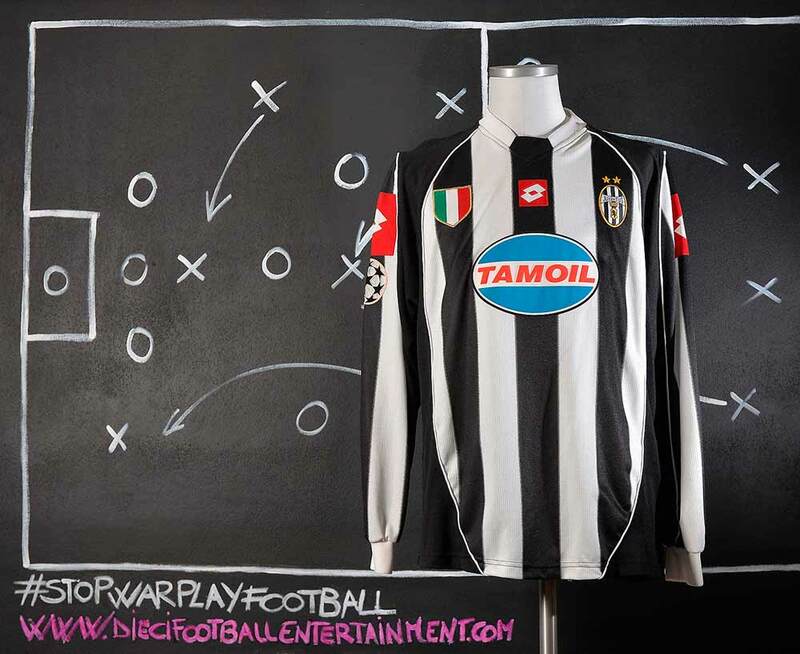 Unfortunately, the only fixture they failed to win during this period, a 1–1 draw against Atalanta in early February, was marred by a serious injury to Alessandro Del Piero, at a time when he had rediscovered his goalscoring touch. 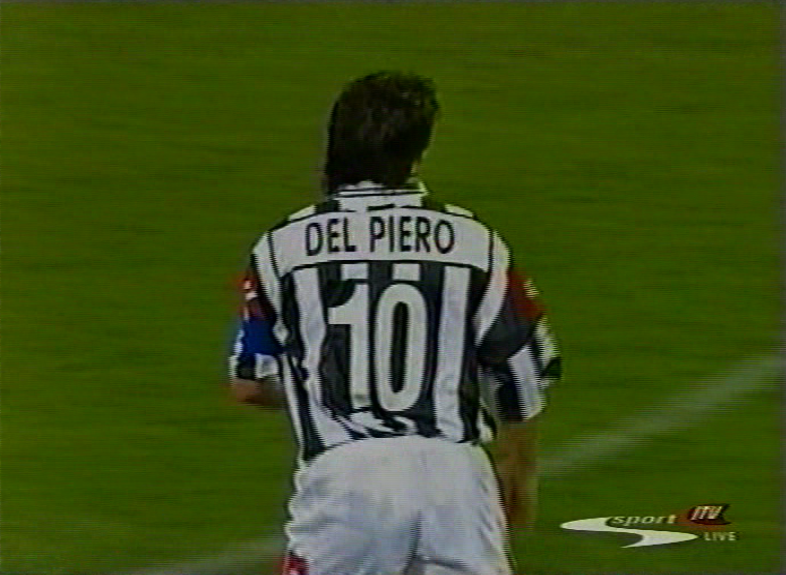 Del Piero missed two months of football following that injury. 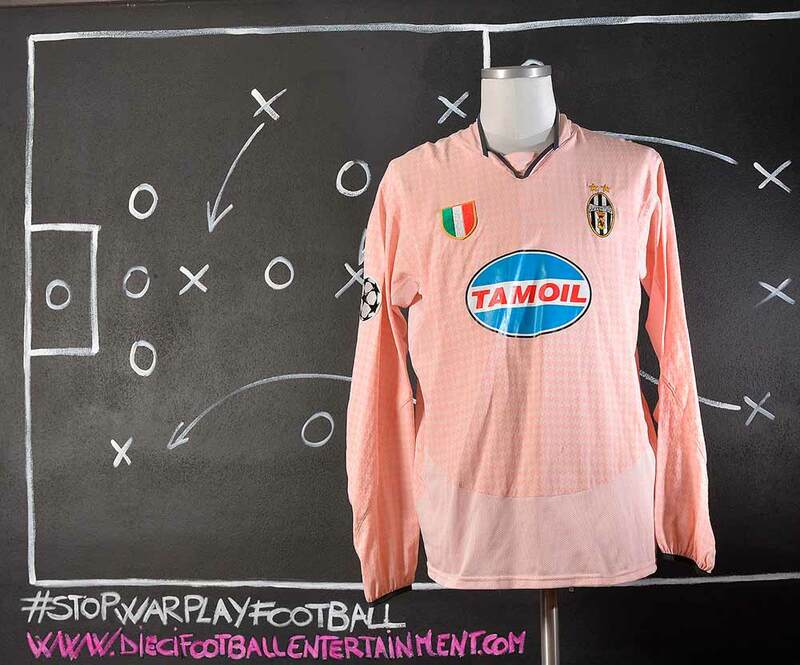 Even in his absence, la Vecchia Signora continued to prevail, though in a less dominant fashion. 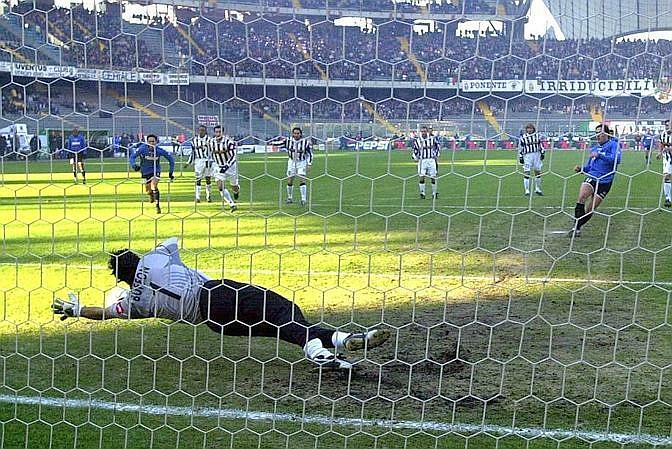 On 2 March, Juventus thrashed Inter 3–0, a result that took the club to top spot in the league, a position it would never leave. After that game, the Bianconeri lost only two more of their remaining games and won most of the remainder, including an important success over Roma, who had been something of a bogey side for the Turin club in previous years. 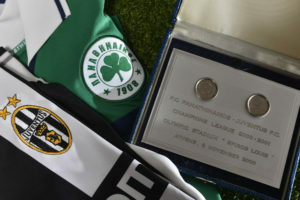 The 27th league title of Juve’s history was confirmed on 10 May, following a 2–2 draw with Perugia. With two games to go, second-placed Inter were no longer in a position to challenge for the scudetto, despite again spending big in the previous summer. 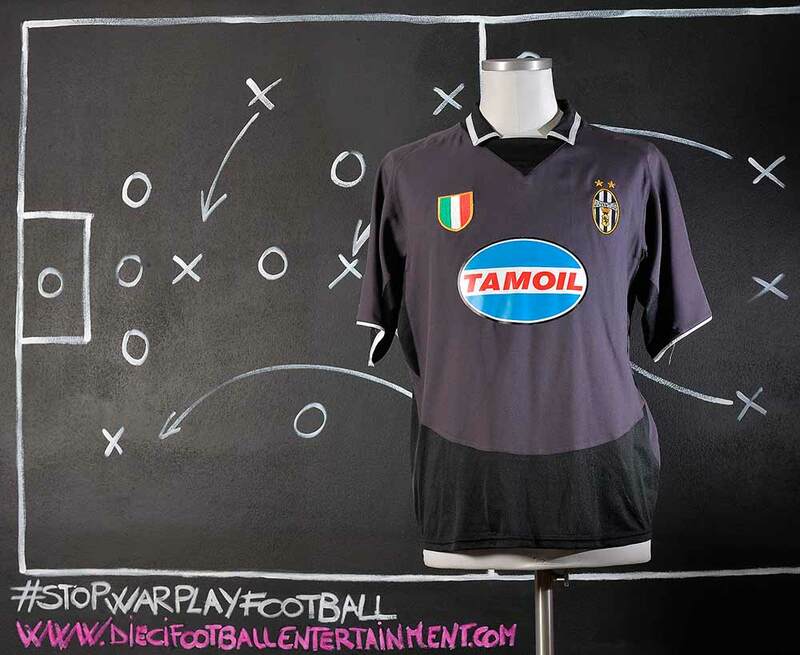 At the beginning of the 2002–03 season, Juventus won the 2002 Supercoppa Italiana against Parma. 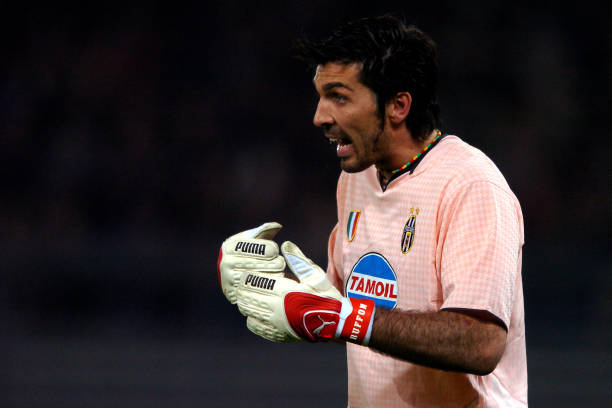 Buffon had a dominant year, totalling 47 appearances in all competitions, of which 32 were in Serie A. He helped Juventus to the UEFA Champions League Final, only for his team to lose in a penalty shoot-out to Milan after a 0–0 draw. Buffon managed to save two penalties, but Milan won the shootout 3–2. Buffon drew praise, however, for making a reaction save on a close-range header by Filippo Inzaghi in the final during regulation time. Buffon saved a Luís Figo penalty in the second leg of the semi-finals, against defending champions Real Madrid, in Turin. Juventus progressed to the final, winning 4–3 on aggregate. Juventus managed to celebrate their second consecutive Serie A title that season, finishing the season with the best defence yet again, as Buffon conceded only 23 goals in 32 appearances. 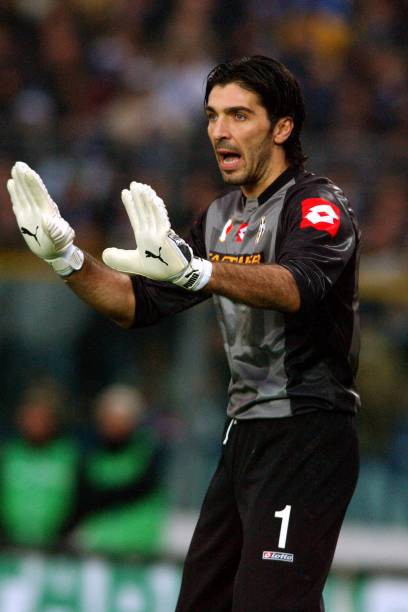 In 2003, Buffon received the Serie A Goalkeeper of the Year for the fourth time. He also became the only goalkeeper ever to win the now defunct UEFA Most Valuable Player or UEFA Club Footballer of the Year award. He also won the UEFA Best Goalkeeper award, and was elected to the UEFA Team of the Year for the first time. He was also named the IFFHS World’s Best Goalkeeper for the first time in his career. 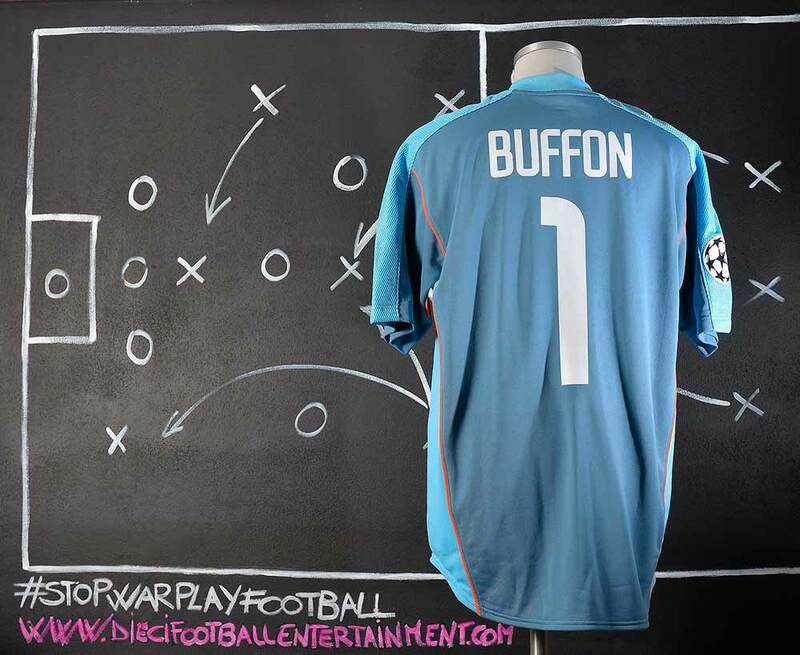 Buffon was also nominated for the 2003 Ballon d’Or that season, finishing in ninth place. Antonio Chimenti was nicknamed Zucchina. 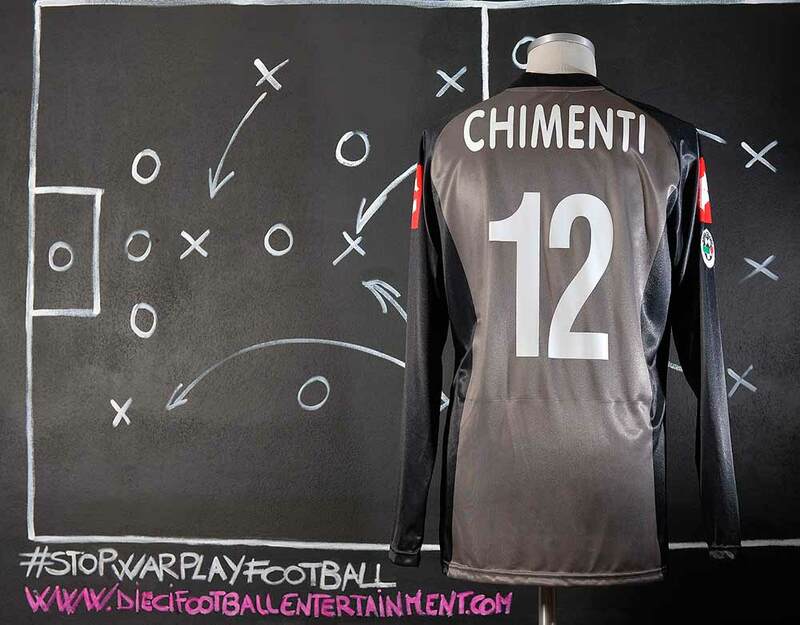 Chimenti was known for his confidence and consistency as a goalkeeper, and for his ability with the ball at his feet. 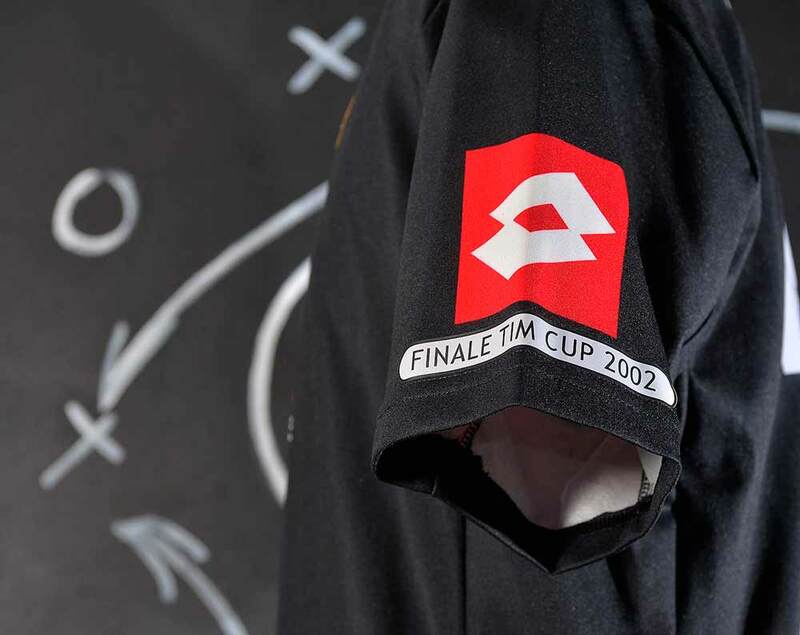 During the season 2003-2004 the Lega Calcio badge on sleeve changed its style. So there are two different versions of each team shirt’s styles. First half of the season Lega Calcio badge. 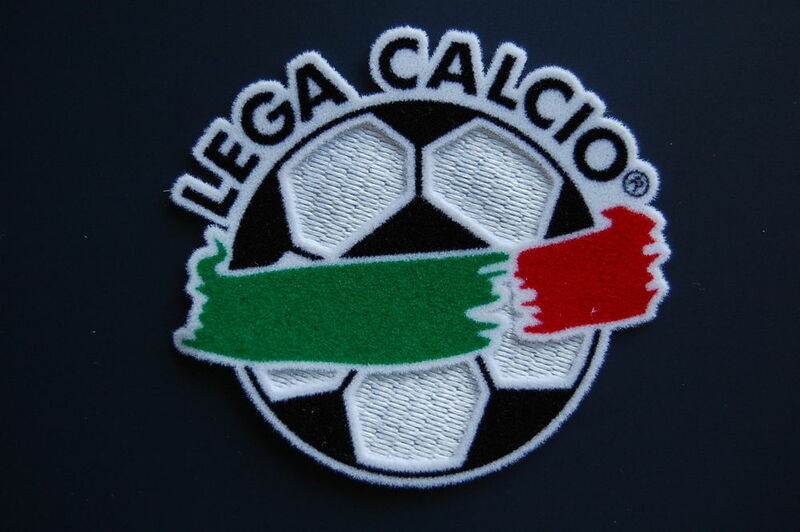 Second half of the season Lega Calcio badge. 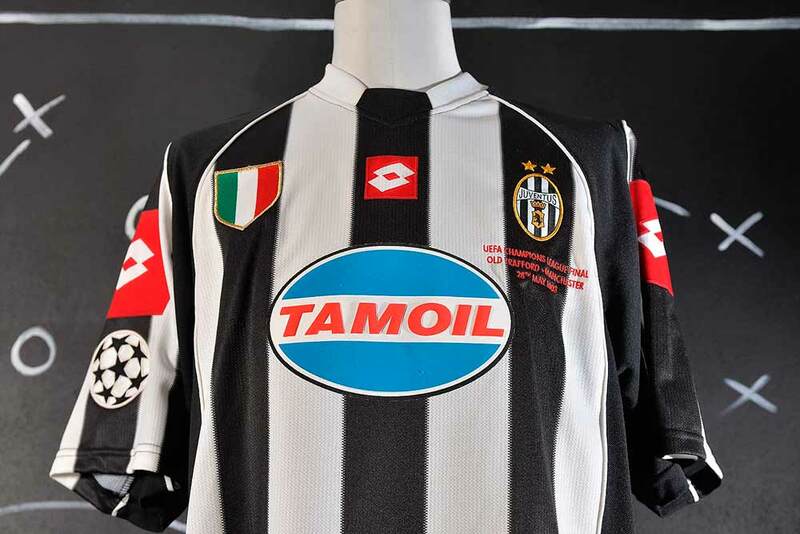 A funny cusriosity about the Champions League shirts from the season 2003-2004 is that the Scudetto badge on chest was positioned in a different position compared to the Serie A shirts. 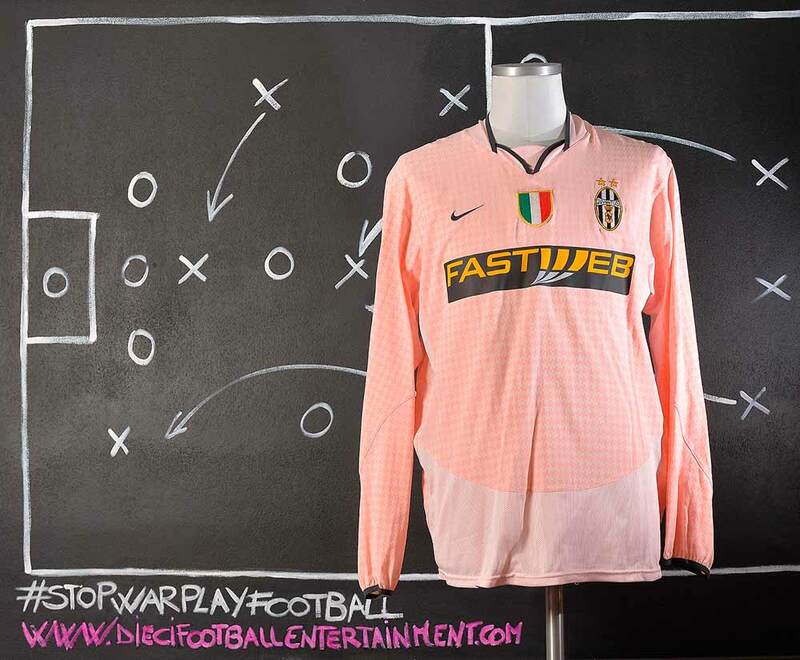 During the Serie A games the team was wearing shirts with Nike swoosh on chest left side and the Scudetto badge in a chest central position. 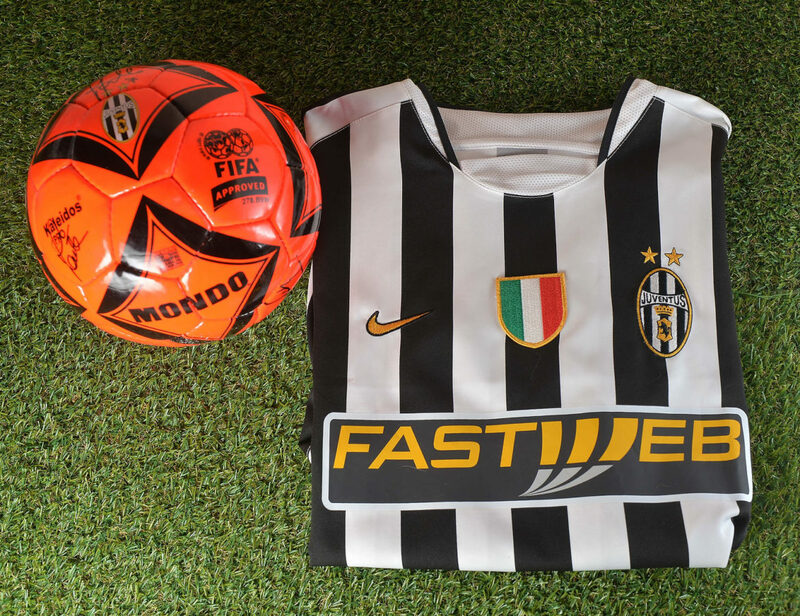 During the Champions League games instead, the Scudetto badge was positioned on the chest left side, sewn above the Nike swoosh. 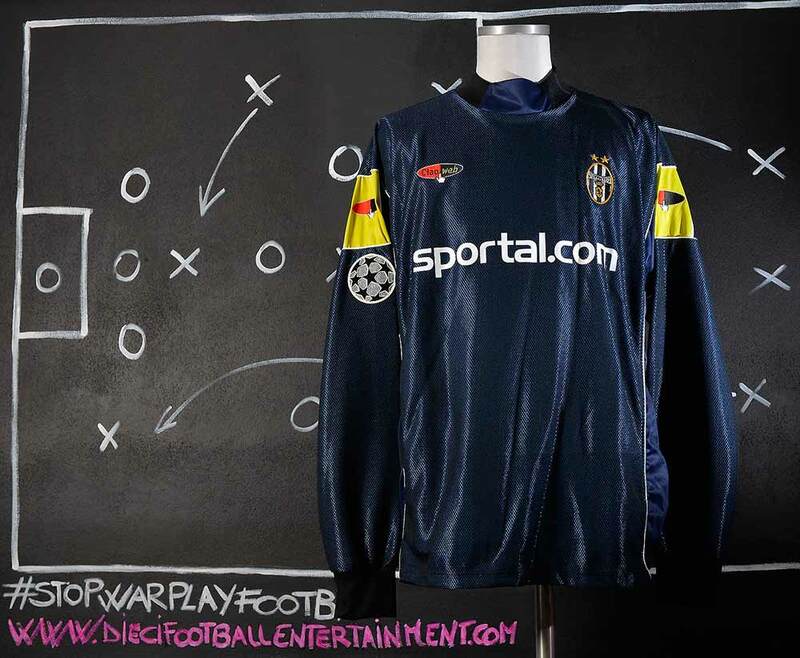 The Nike swoosh was not visible on Champions League shirts since it was totally covered by the Scudetto badge. The reason? 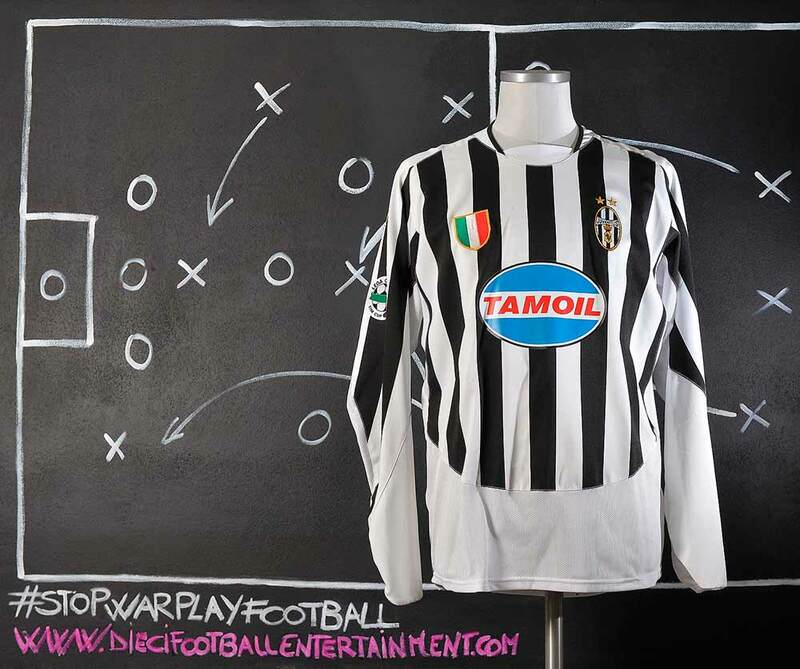 The Champions League sponsor was Tamoil, an oil company owned by the Government of Libya. 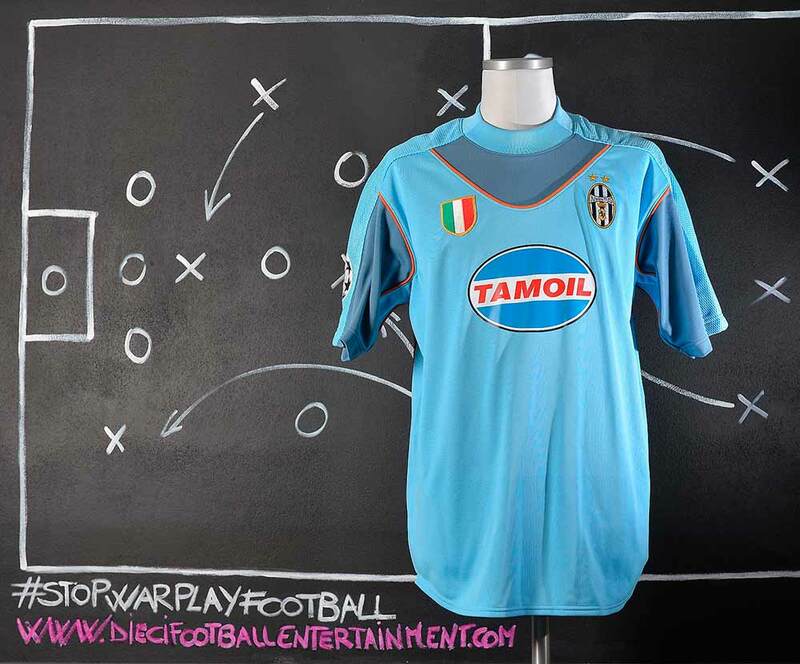 The Government of Lybia never wanted to have the Tamoil logo with an american brand’s logo (Nike) on the same shirt. 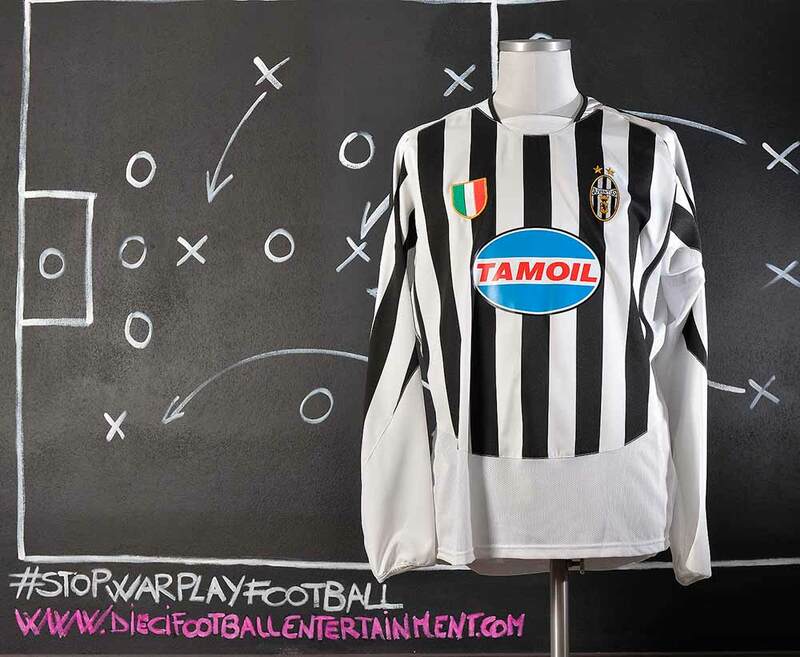 So the terms of Tamoil’s sponsorship was to cover the Nike swoosh everytime that the Tamoil logo was visible. As it happened for the Serie A badges, the Tim Cup badges of the season changed. So there are two different Tim Cup versions of each team shirt’s styles. The 2004 Coppa Italia Final was a two-legged affair played between Lazio and Juventus. The first leg was played in Rome on March 17, 2004, in which Lazio won 2–0. The second leg was played on May 12, 2004 in Turin and the two clubs drew 2-2, giving Lazio their 4th title on an aggregate result of 4–2. 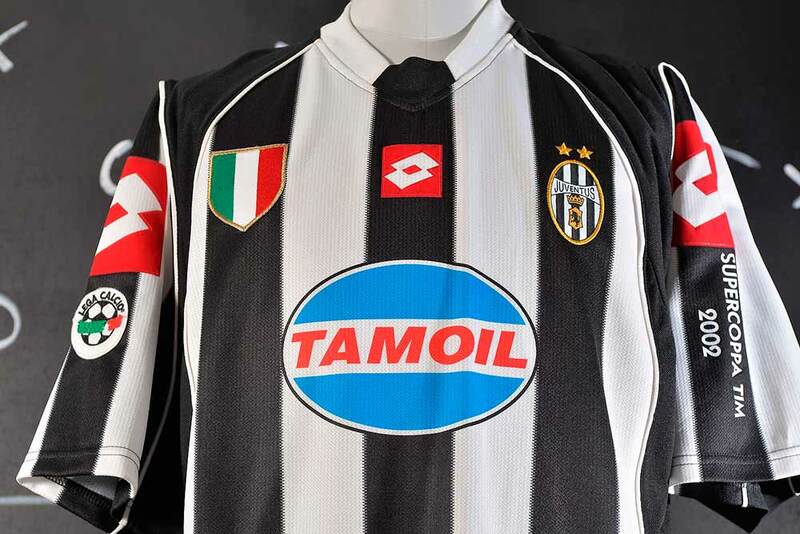 Despite of what we previously said about the Government of Libya that was not allowing the team to play with sponsor Tamoil with Nike Swoosh visible on the shirt, for the Italy Cup Final only, the team played with the Scudetto badge in central chest position making the Nike logo on the left chest side visible. 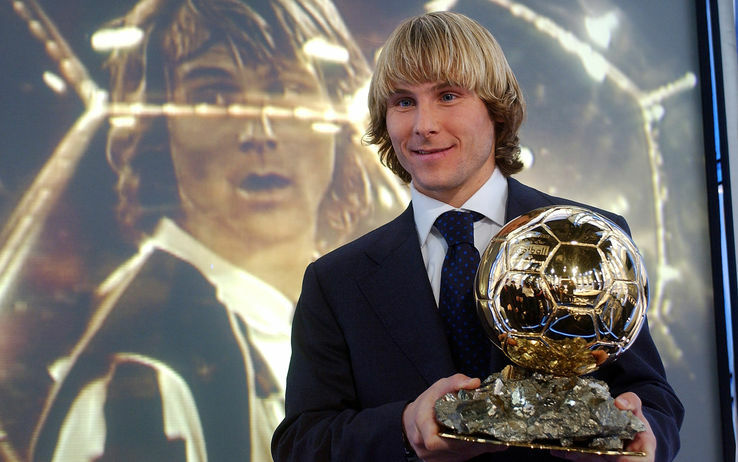 In 2003 Pavel Nedved won the Golden Ball. Winning the Ballon d’Or as European Footballer of the Year in 2003, Nedvěd was the second Czech player to receive the honour and the first since the breakup of Czechoslovakia. He was also named World Footballer of the Year by World Soccer. 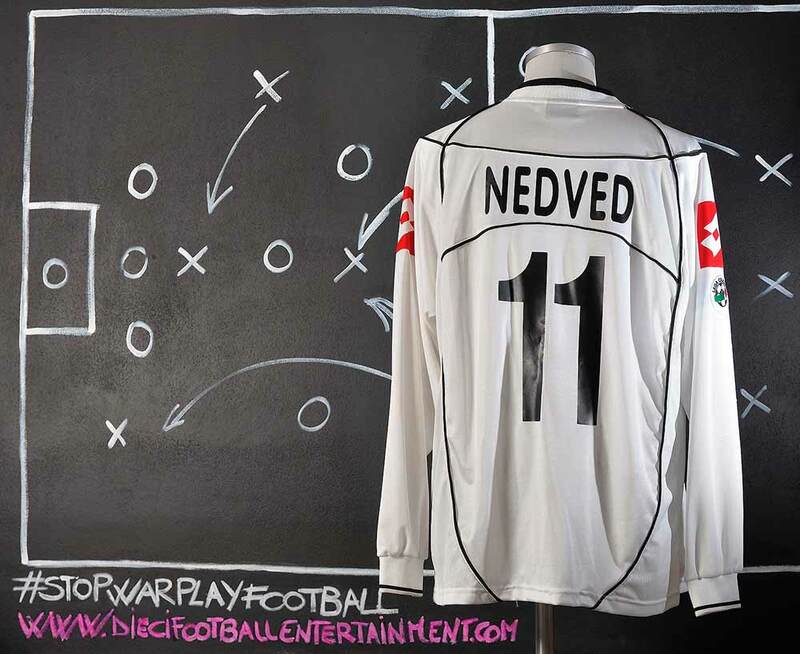 Nedvěd received further recognition in his home country when he won the 2004 Golden Ball, awarded by Czech sportswriters, for the fifth time in seven years. 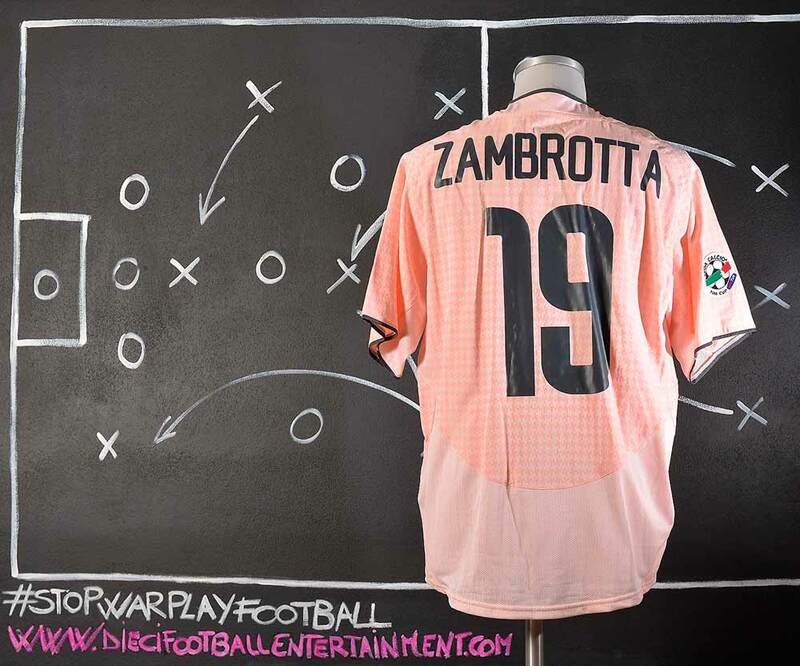 Zambrotta remained a regular first team player as Juventus won their second consecutive Scudetto and reached the Champions League final, in which they were defeated by Milan in a penalty shoot-out after a goalless draw. 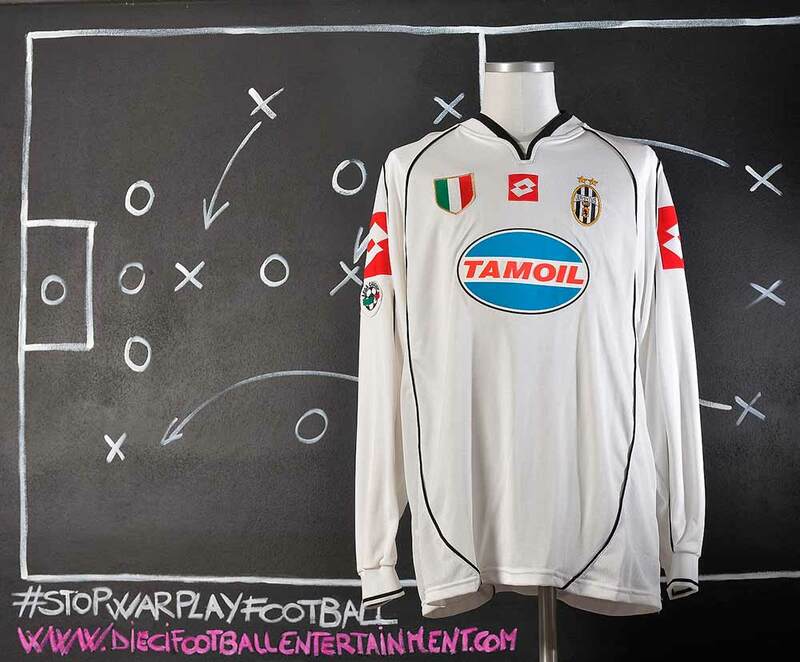 The following season, Juventus avenged the defeat by beating Milan to the 2003 Supercoppa Italiana on penalties, although they failed to retain their league title or progress in Europe. Zambrotta won four Scudetti with Juventus, making a total of 217 league appearances and scoring seven goals in six seasons. 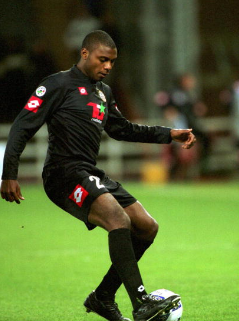 At the start of the 1996–97 season, Davids moved to Italy to play for Milan. After an unsuccessful spell where he failed to establish himself in the first team, he moved on to league rivals Juventus in December 1997 for a £5.3 million transfer fee. He soon became a permanent first team member in the midfield, usually playing on the left flank or in the centre, as a defensive midfielder, forming a notable midfield partnership alongside French playmaker Zinedine Zidane. 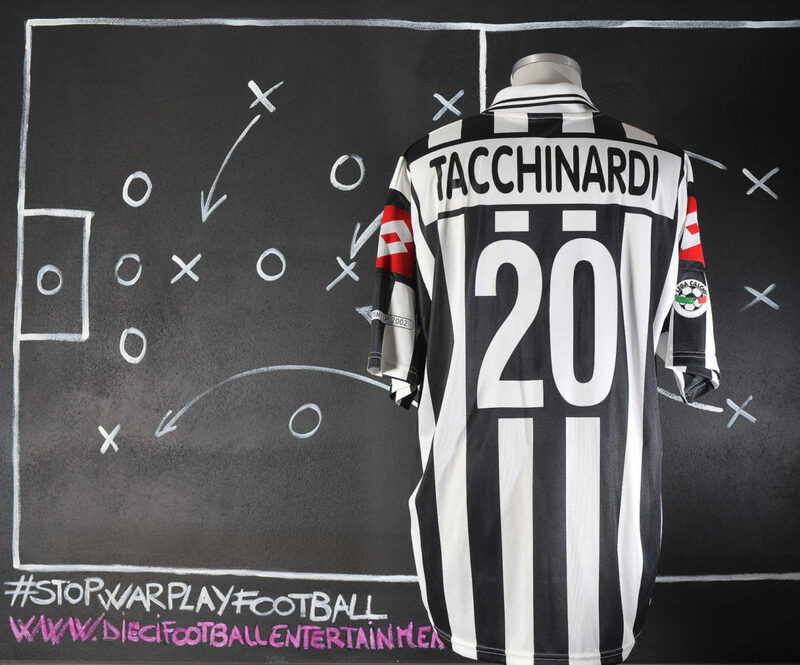 Six successful years in Turin followed, with Davids helping the side to the Serie A title in 1998, 2002 and 2003, as well as two Supercoppa Italiana and the UEFA Intertoto Cup. 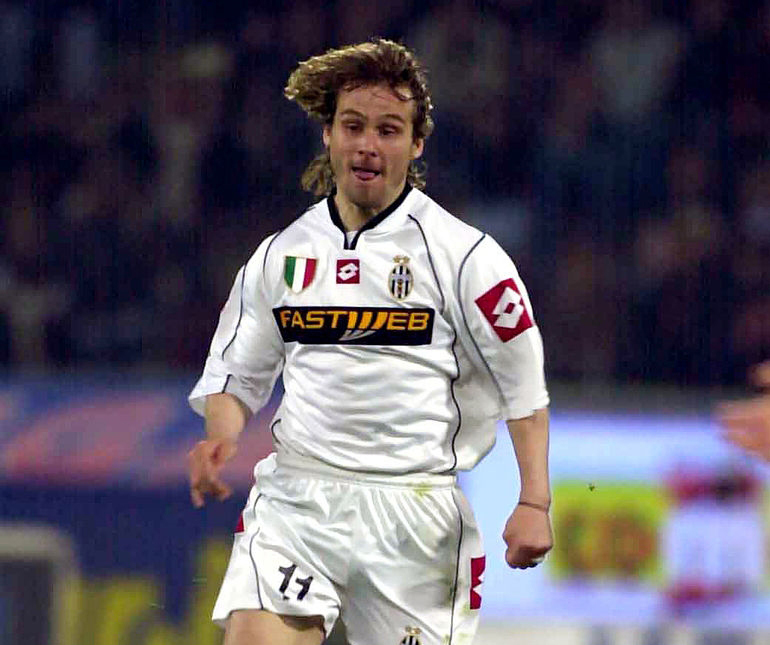 Juventus manager Marcello Lippi once described him as “my one-man engine room”. 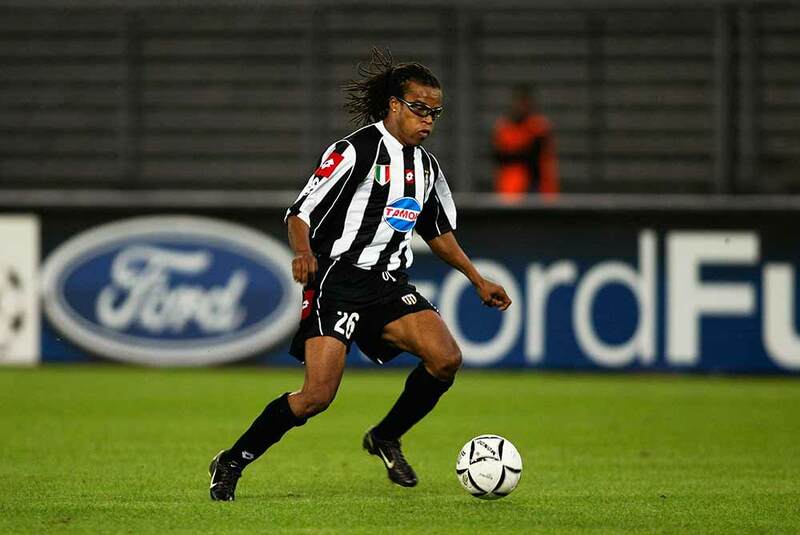 Davids was often inspirational in Europe, playing 15 times as the club made it all the way to the 2002–03 Champions League final before losing to Milan on penalties. He had also previously managed to reach the Champions League final with Juventus in 1998, followed by a semi-final finish during the 1998–99 season, as well as reaching the 2002 Coppa Italia Final. 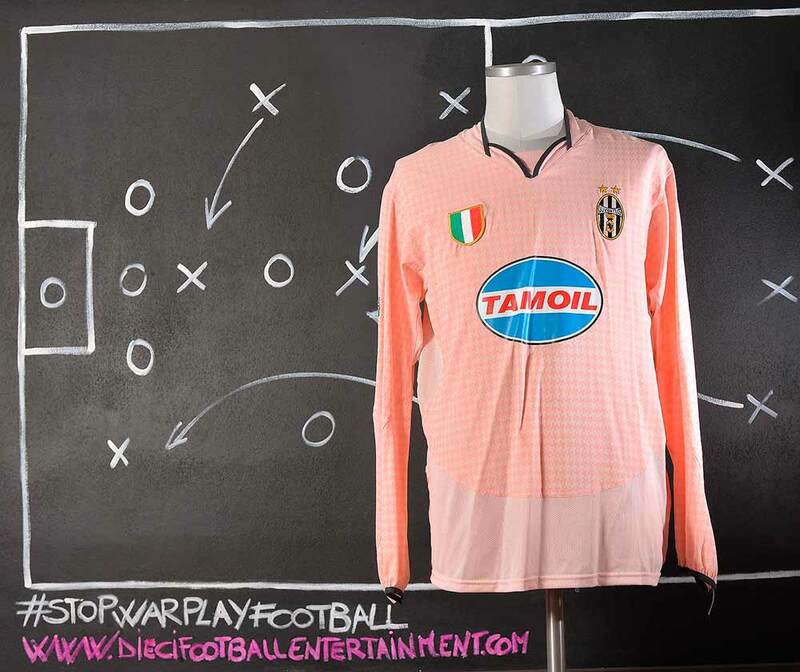 This shirt’s style was not used in the Tim Cup Final against Lazio S.S. The team played in Roma for the first round with the purple away shirt and the second leg in Turin with the home version. 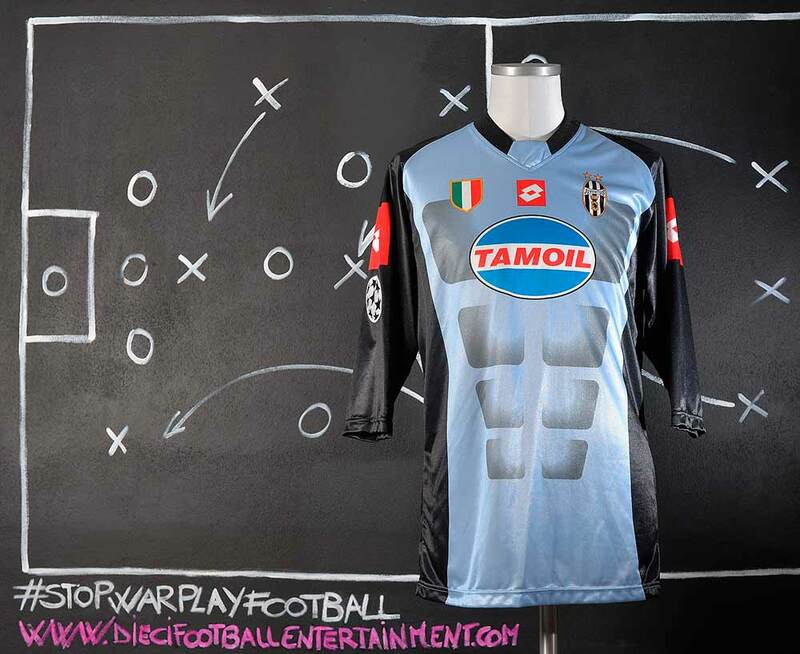 It is by the way an Italy Cup Final’s prepared shirt since, as we explained before, this the only game where the team played with both Tamoil sponsor and Nike swoosh visible. 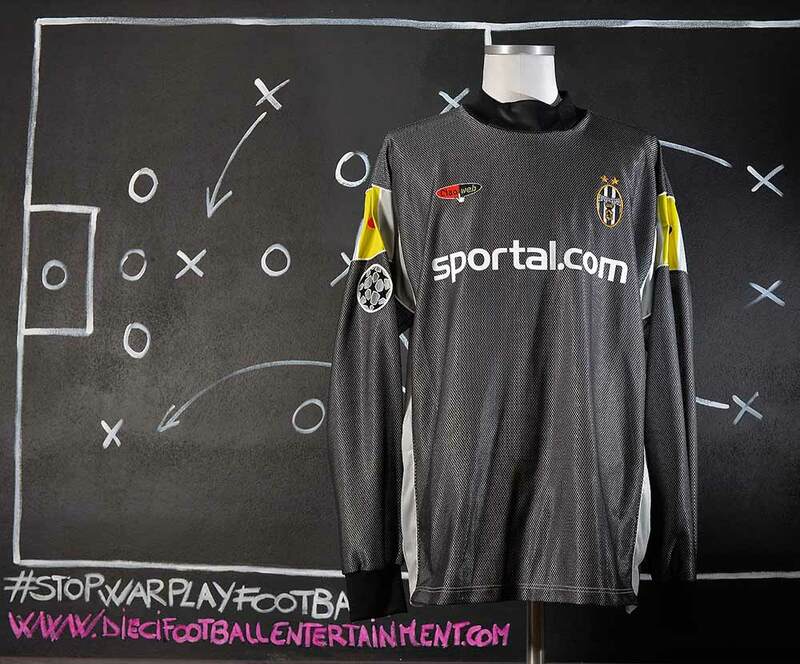 This is not a regular goalkeeper’s shirt. 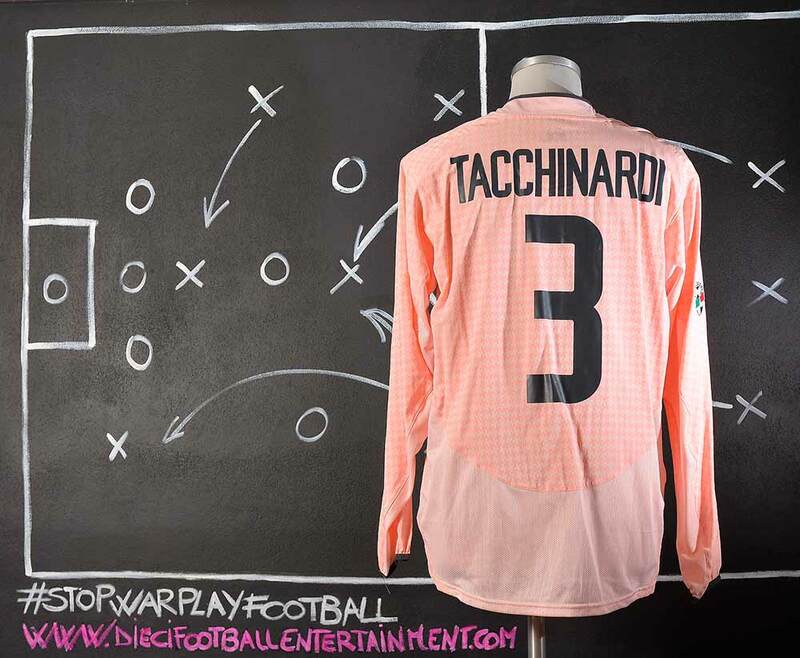 This is the second away regular player’s shirt but it was turned in to a goalkeeper’s shirt under request of Gianluigi Buffon who wanted to play with this shirt’s style. 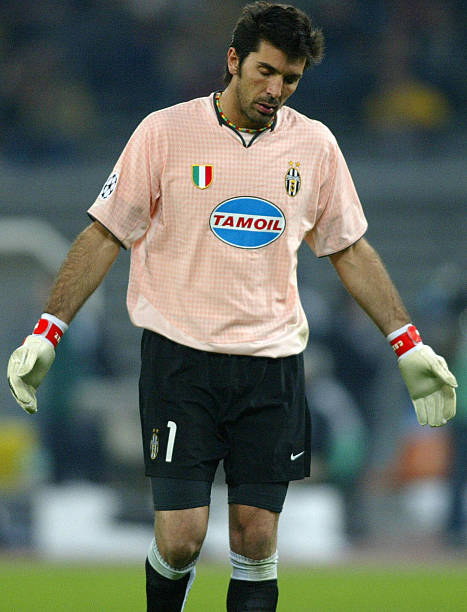 Buffon began the 2003–04 season with Juventus by defeating Milan on penalties in the 2003 Supercoppa Italiana, with Buffon saving a penalty in the shootout, after a 1–1 draw. Juventus were eliminated in the round of 16 of the Champions League that season by Deportivo de La Coruña and finished the Serie A season in a disappointing third place, although they managed to reach the Coppa Italia Final. 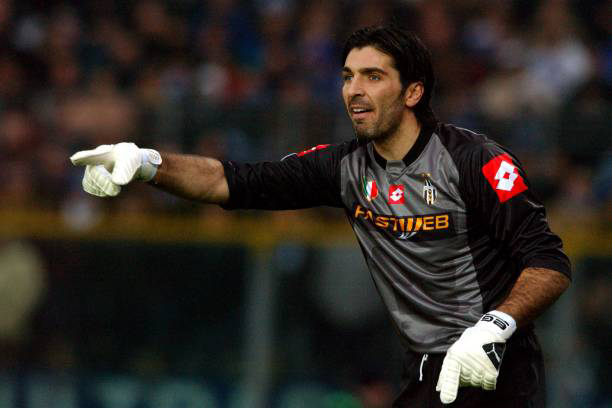 Buffon made his 100th appearance for Juventus that season on 30 September 2003 in a 2–1 away win over Olympiacos in the group stage of the Champions League. He was named by Pelé as one of the top 125 greatest living footballers in March 2004, but missed out on the Serie A Goalkeeper of the Year award, which went to Milan’s league-winning goalkeeper Dida. He was once again elected as the Goalkeeper for the UEFA Team of the Year and as the IFFHS World’s Best Goalkeeper. 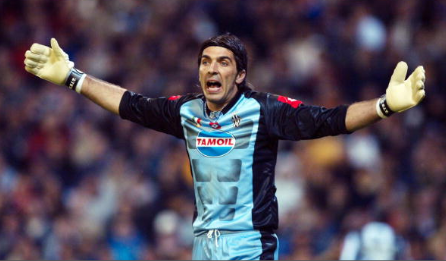 Buffon also received his first ever FIFA World Player of the Year nomination in 2004, finishing in 21st place alongside countryman Paolo Maldini. This shirt is a very special shirt. 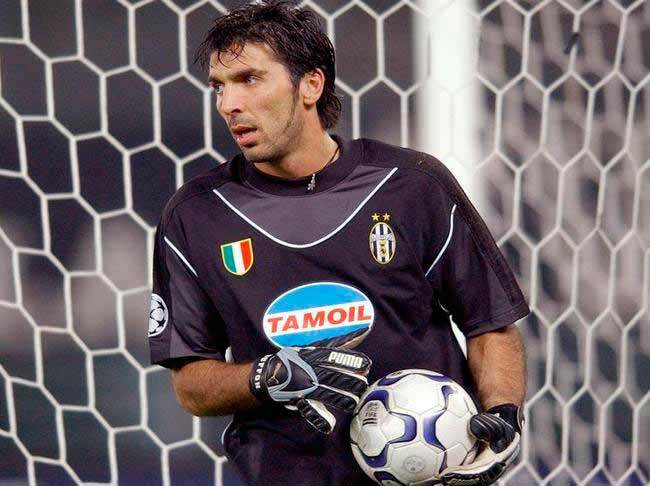 This is the first time ever that a Juventus’s goalkeeper wore the actual regular home black and white player’s shirt. 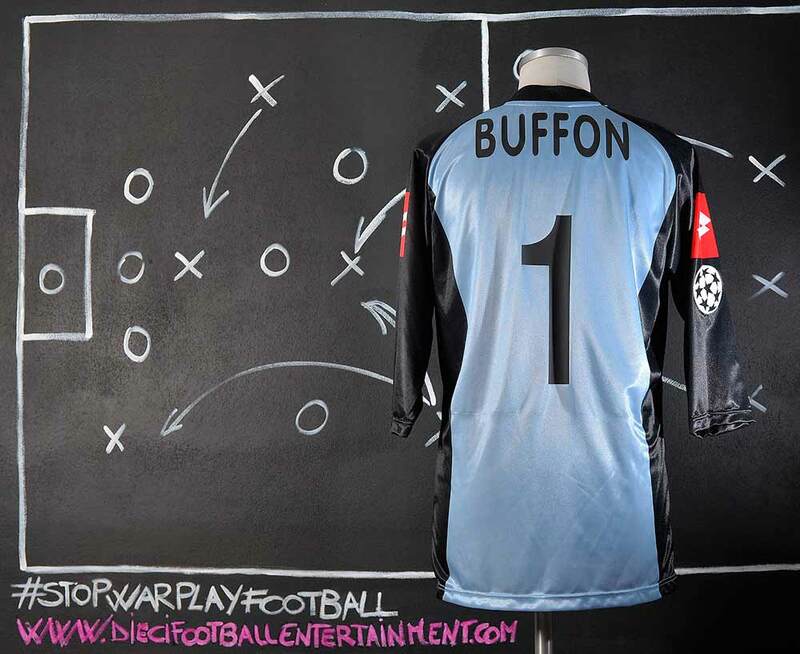 This is not a goalkeeper’s shirt. 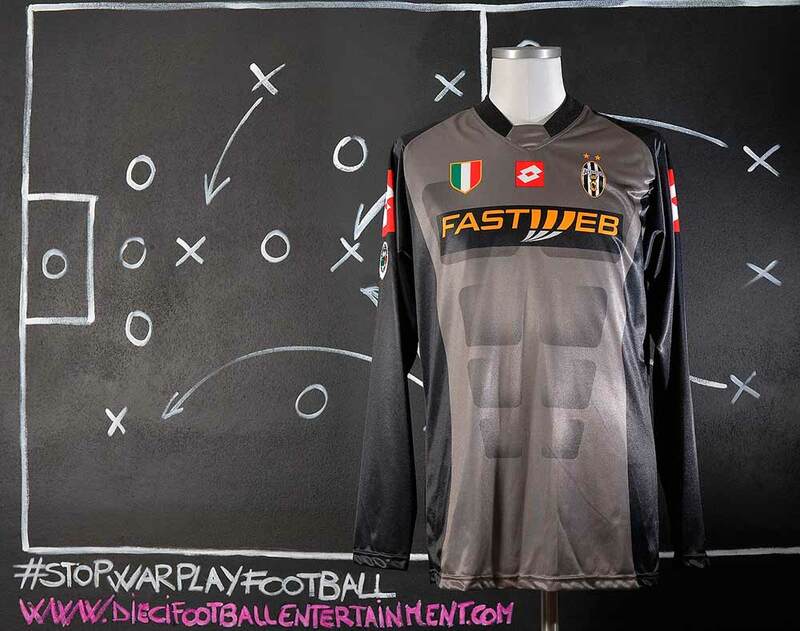 But it’s the regular player’s shirt and it was turned in to a goalkeeper’s shirt under the request of Gianluigi Buffon who wanted to play with this shirt’s style. The team used for its home games during the season 2003-2004 the Lotto Kaleidos ball. At that time every team had the chance to use its own ball since there was a common ball decided by Lega Calcio as it happens nowdays in all of the championships. The funny thing at that time was that all of the teams were swapping their balls with other teams in order to give opponent teams the chance to practice with the ball they were going to use for away games. It means that during the week prior an away game, most of the teams were using the ball they were about to use on Sunday. This Lotto Kaleidos ball was used during the game against Siena on January 18th 2004 and it’s the orange version of the regular Kaleidos used in case of fog or snow. 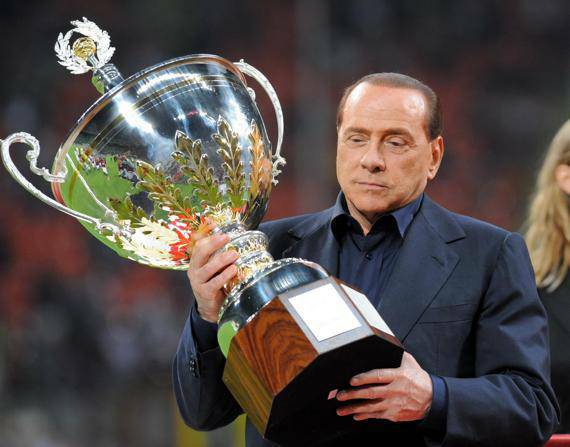 The Trofeo Luigi Berlusconi (Luigi Berlusconi Trophy) is an annual friendly football match. It is organized by Italian club Milan, and usually takes place in August at the San Siro, their home stadium. The competition was founded by Milan owner Silvio Berlusconi in memory of his father Luigi, and was originally intended to be contested by the Rossoneri and the UEFA Champions League winners. However, in the first edition — which took place on 23 August 1991 — they faced Juventus instead of Red Star Belgrade. The match was won by Juventus 2–1. Over the next three years, Milan played against Internazionale, Real Madrid and Bayern Munich respectively, winning all three times. 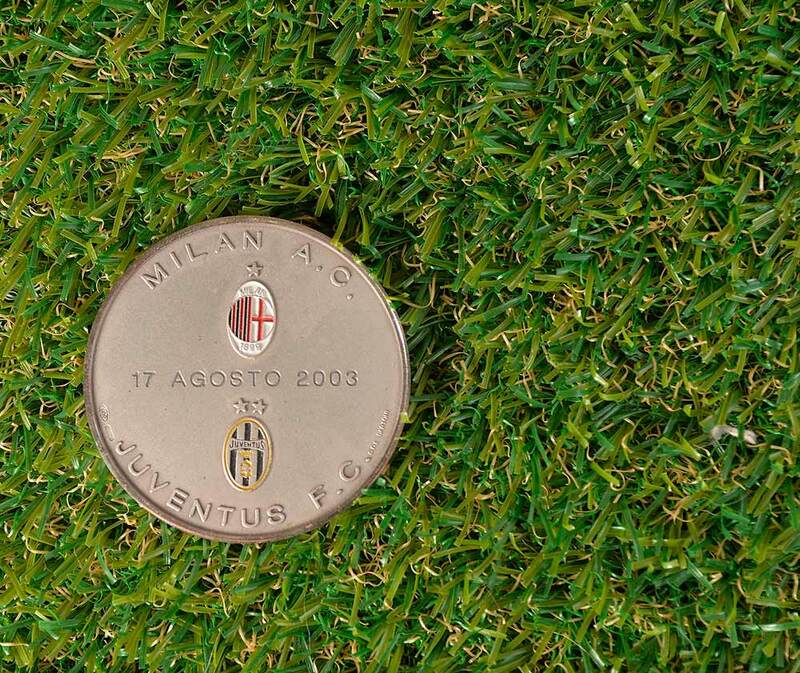 Between 1995 and 2012 the Trofeo Luigi Berlusconi was contested exclusively between Milan and Juventus. Due to scheduling conflicts no game was played in 2013. 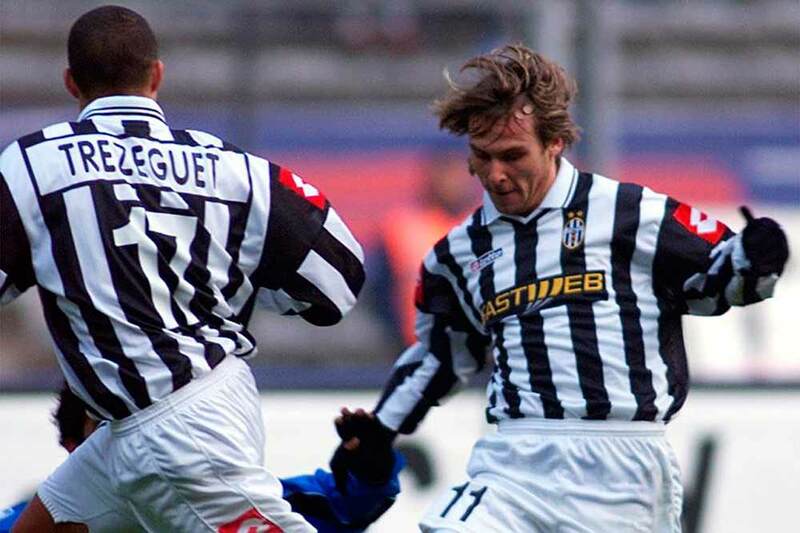 In the 19 times Milan and Juventus have played each other, Juventus holds a 10–9 edge. The game returned in 2014 – the 23rd edition. It was scheduled in November, but was not played against Juventus, but and Argentinian team, San Lorenzo. Milan won the game 2–0 to earn its 13th trophy. 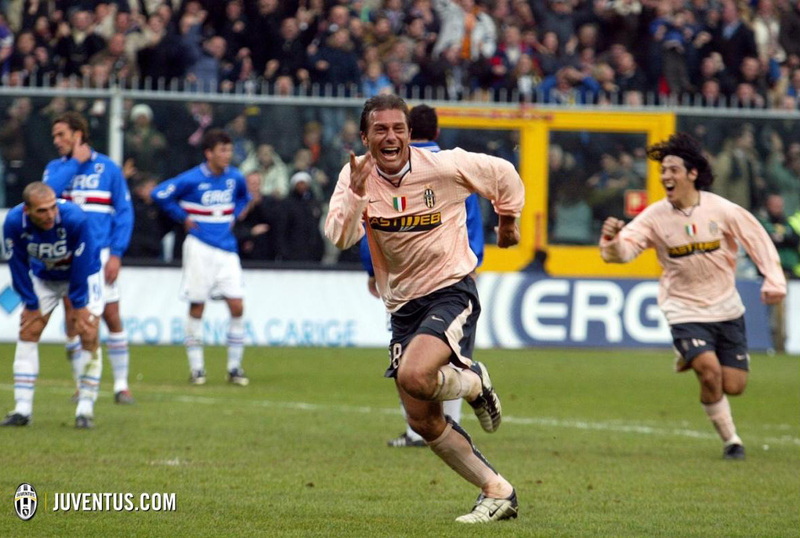 In the 2003 Juventus defeated Milan 2-0 with the goals of Alessandro Del Piero e Mauro German Camoranesi. 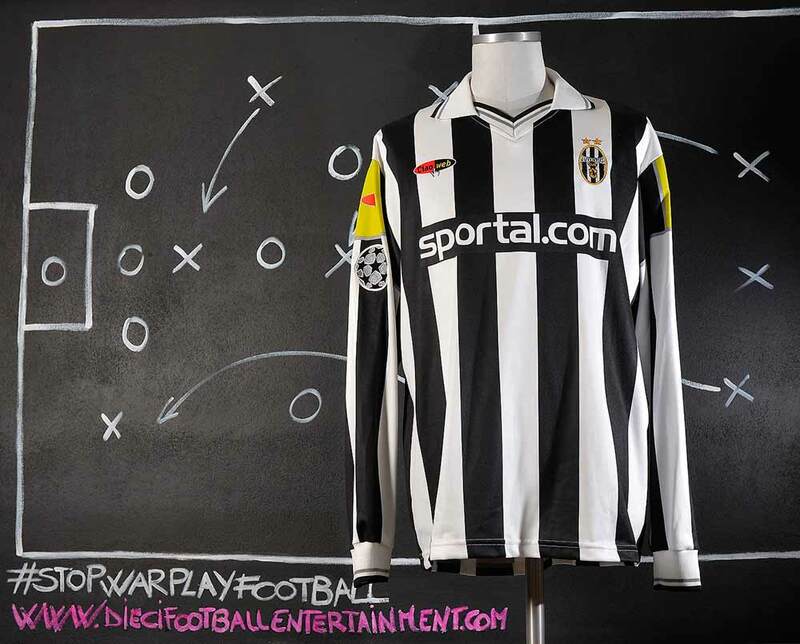 This shirt was worn by Zlatan Ibrahimovic during Udinese vs Juventus of the season 2004/2005 which took place in Udine on October 3rd 2004. 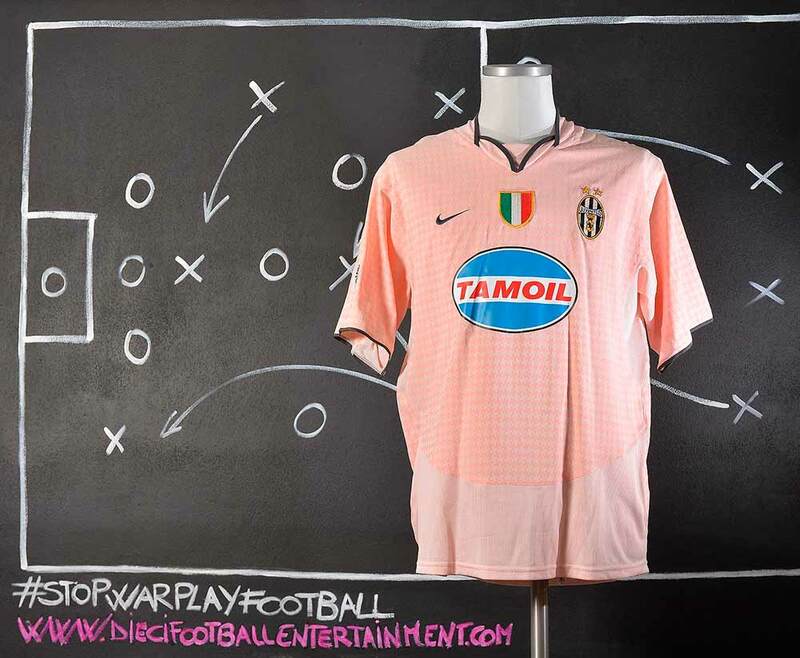 The team wore home kit even if they played away (Udinese played with pink away kit) and the shirt was swapped by Zlatan Ibrahimovic with an Udinese player who we got this shirt from. In the 2004/2005 season the team had a new coach: Fabio Capello. This choice was a big surprise for all of the Juventus fans as just few months before Capello, ex A.S. Roma coach said he wouldn’t have been interested to become Juventus coach. 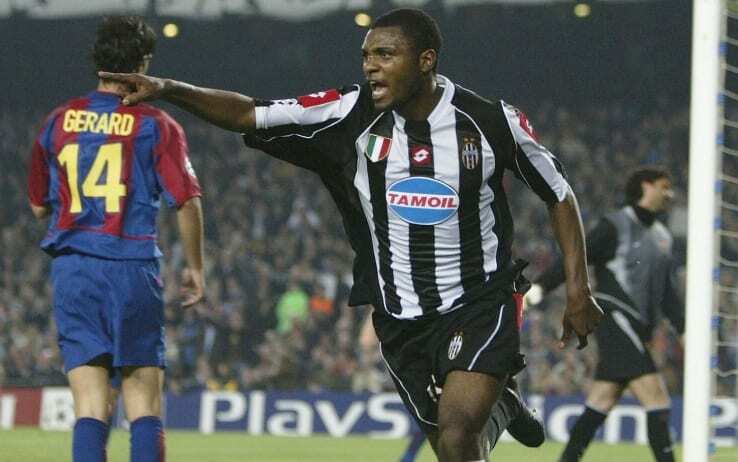 Together with Fabio capello also Emerson and Zebina moved from A.S. Roma to Juventus. Other two big players like Zlatan Ibrahimovic and Fabio Cannavaro joined the team. The 2004/2005 was an hard season due A.C. Milan that challenged Juventus all season long. On the 35th Serie A game, Juventus went to Milan to play against A.C.Milan. 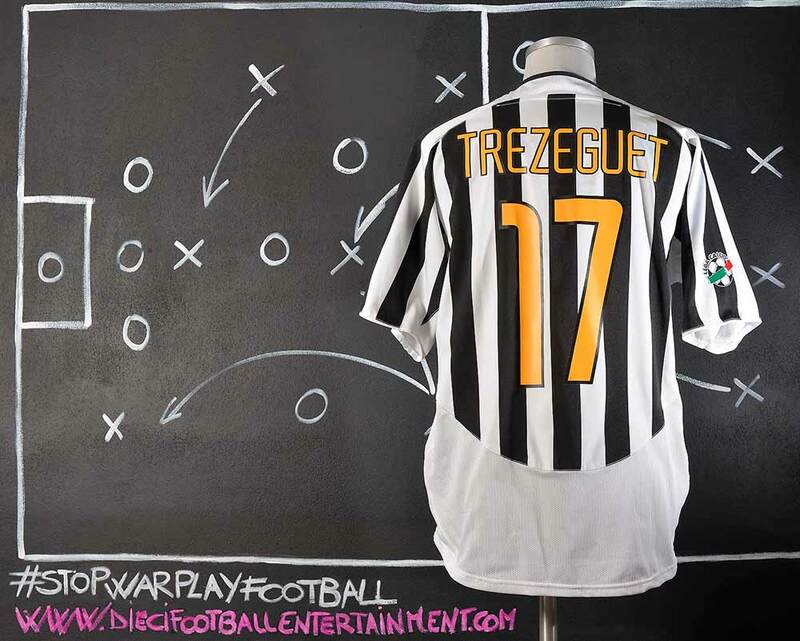 Juventus won 1-0 (Trezeguet amazing goal after an incredible Del Piero bicycle kick pass) and it was able to keep 3 points distance and the the team won the Serie A. 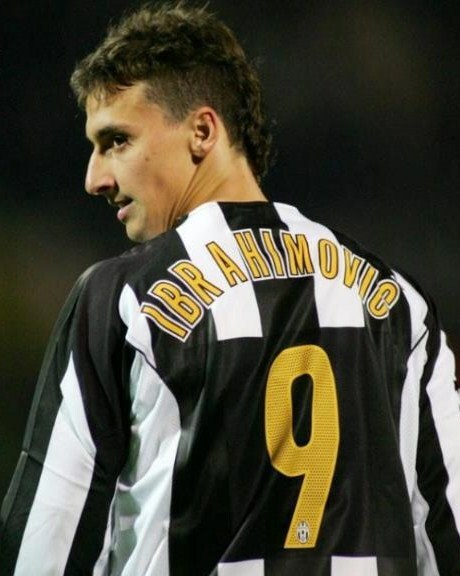 In the summer 2004 Ibrahimović moved from Ajax to Juventus for €16 million. He was promptly inserted into the starting eleven due in part to top scorer David Trezeguet’s injury problems, and scored 16 goals. Near the end of the season, Juventus reportedly rejected a €70 million bid for him from Real Madrid, which was later revealed to be a publicity stunt initiated by Ibrahimović’s agent, Mino Raiola, in order to increase his market value. 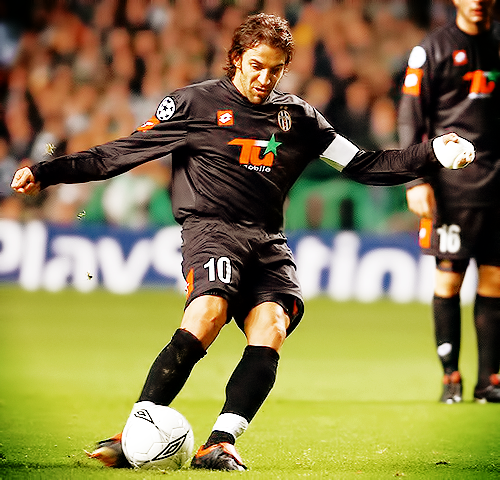 The 2004-2005 Champions League main competition was reached through the preliminary round against Djurgarden. The team then went out in the quarter-final leg against Liverpool F.C. Another sponsor issue took place with the team for the Champions League game against Maccabi Haifa in Tel Aviv. 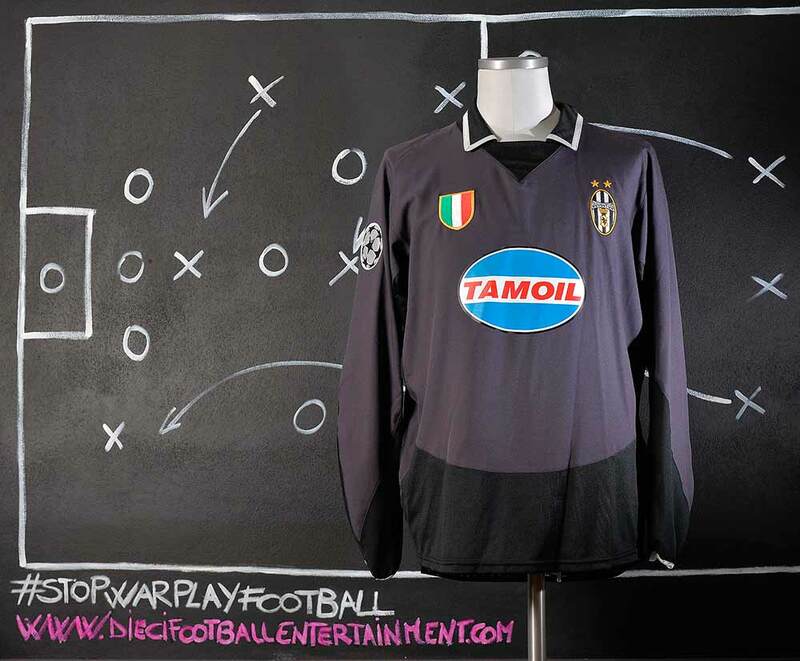 The Tamoil sponsor, owned by the Government of Libya was not used on team’s shirts for a specific reason. The Government of Libya, which is an Arab country, didn’t want the Tamoil logo being sponsored in Israel due the historical dispute between Israel and the Arab countries. So the team played with no sponsor on chest. 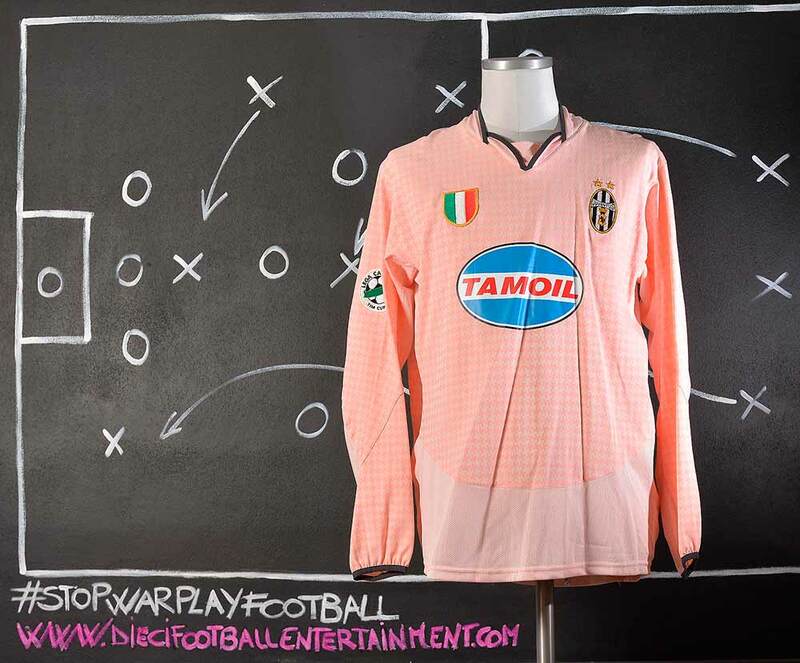 So the team used a regular Serie A’s shirt without a sponsor on front and with a black square on the back for Uefa Rules which was different from regular Champions League shirts used for the rest of the season.